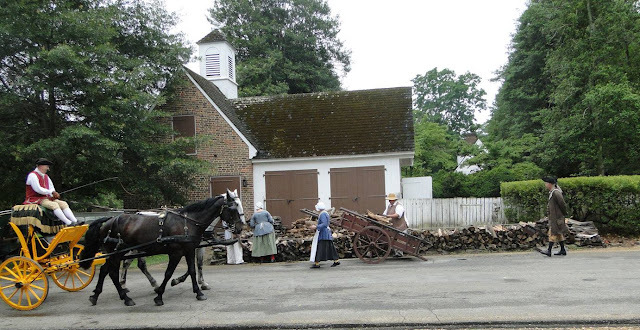 ~Here we go with the third part in my Colonial Williamsburg Adventure (click HERE for part two and HERE for part one). I am already working on parts four and five, and I believe there may be a sixth one as well. Yes, I took that many pictures! Since physical photo albums are *almost* a thing of the past, and showing slides on a screen in a darkened room pretty much are a thing of the past, it is in my opinion that using my own Passion for the Past social history blog is the best way for me to not only document our trip, but to share my experiences with those who are also interested. 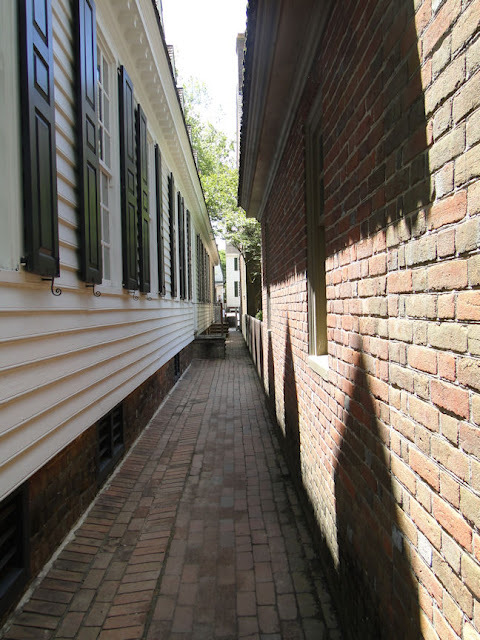 As historians we've marveled at the restoration of old homes; of the details showing the way they were when originally built a hundred, a hundred and fifty, or even two hundred-plus years ago. Now, imagine having a vision...the want...of restoring an old colonial city - yes, an original city from the 18th century - in its entirety. That's what Colonial Williamsburg is: an entire city that has been restored to as close to the way it was during the time of the American Revolution nearly 250 years ago. 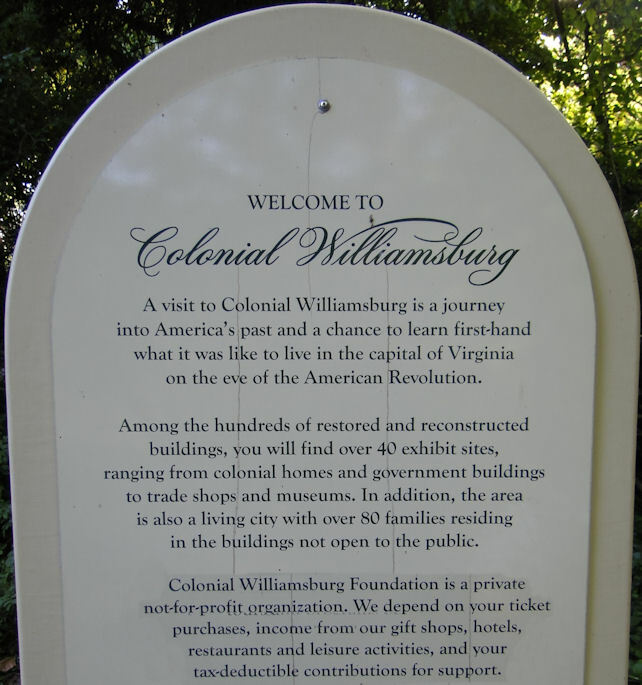 And, to my knowledge, it's the only fully restored colonial city in America. Well, by the turn of the 20th century, many old houses in Williamsburg had been embellished...updated, rather...with Victorian porches (while) others were quietly rotting away with tottering walls and sway-backed roofs. Chickens scuttled out of the ruts in Duke of Gloucester Street as oxcarts creaked past, churning it into deep mud or thick dust, depending on the weather. Yet from every twisted shade tree, from every mossy, sagging fence, the past cried out to those who would listen. 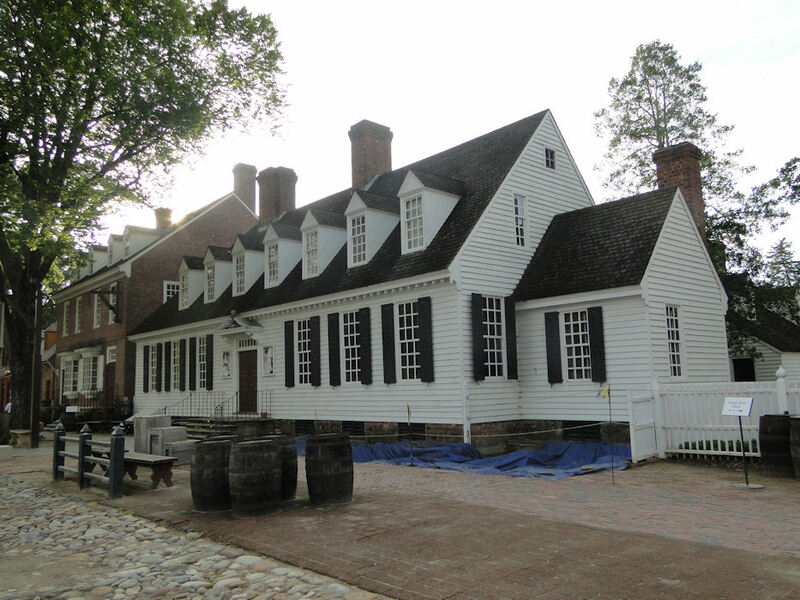 Here was where Colonel Washington trotted toward the Governor's Palace to discuss the exploration of western lands with Lord Dunmore, and here was where young Tom Jefferson strolled to Raleigh Tavern for a little jollity in the Apollo Room, only to be spurned by his fetching "Belinda." But Goodwin, unlike others with the same seemingly out-of-reach restoration dream, took action by contacting the right person, John D. Rockefeller, to finance this endeavor. And thank God he did, for now we have an authentic living, breathing picture of the past like no other place in our nation. 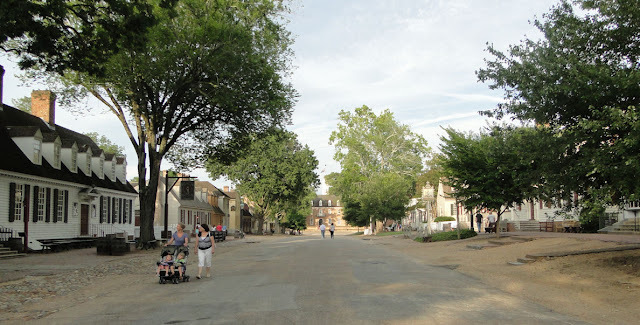 At the forefront of my mind since I've returned from this amazing trip to Colonial Williamsburg has been the question of what was the one thing that stood out the most for me in this historic city? In fact, I was asked the very same thing by a few other of my history nerd friends. Understand, I was not asked what my favorite house or object or activity was, but what was it that grabbed my attention - what stood out to me. As I said, this same query has been picking at me since we pulled out of the parking lot of the visitor center on our last day there to begin our 12+ hour journey home to Michigan. Colonial Williamsburg is historically engulfing. Immersing. The past really does cry out to those who will listen. 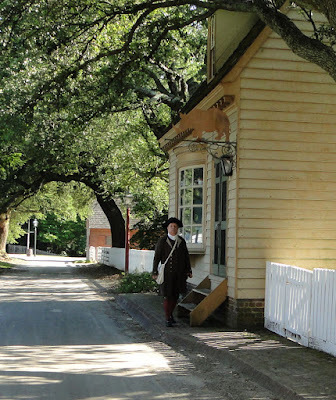 This restored city has brought the 1770s to life by way of surrounding all who enter in a blanket of 18th century life. The world of all things colonial opens up before your eyes: houses & stores, brick walkways, horses & carriages, and...people. Everywhere you look you see colonial people: presenters and interpreters (obviously), souvenir store sales people, waiters and waitresses, delivery people, street cleaners...pretty much every employee - dressing the part and interacting with visitors. 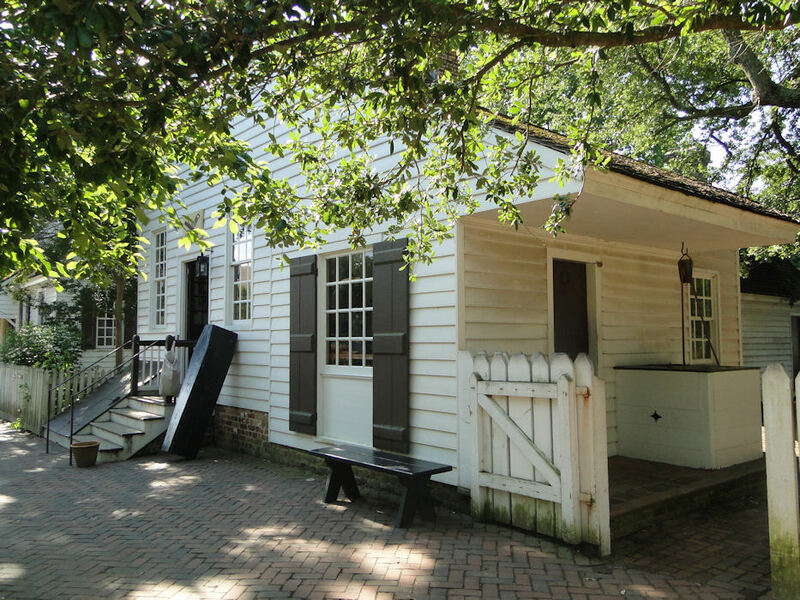 The William Pitts Shop was, in the 18th century, an apothecary. It is now a children's souvenir shop. They sweep their stoops (as you see Amy here at the Pitt Store), converse with one another as neighbors, walk up and down the sidewalks interacting with modern (and colonial!) 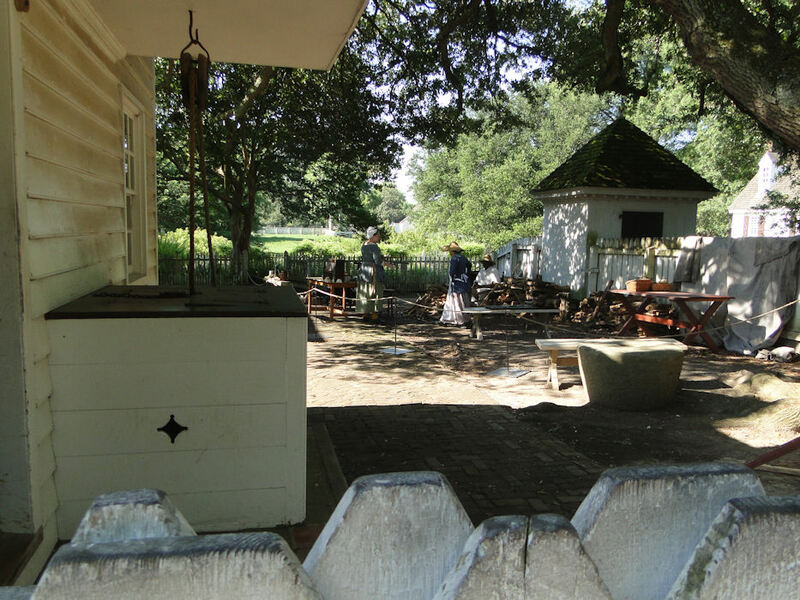 visitors, and push period "delivery" wheelbarrows from one location to another. Williamsburg has gone the extra mile to have all of its visitors steeped in colonial life. Even the workers who are found in stores selling souvenirs are dressed period! And you don't see that at most historical places. Just one example of this is the Prentis Store. Early in the 18th century, Archibald Blair and Philip Ludwell saw a need for a retail business in the relatively new city of Williamsburg, and brought orphan William Prentis over from London as their apprentice. 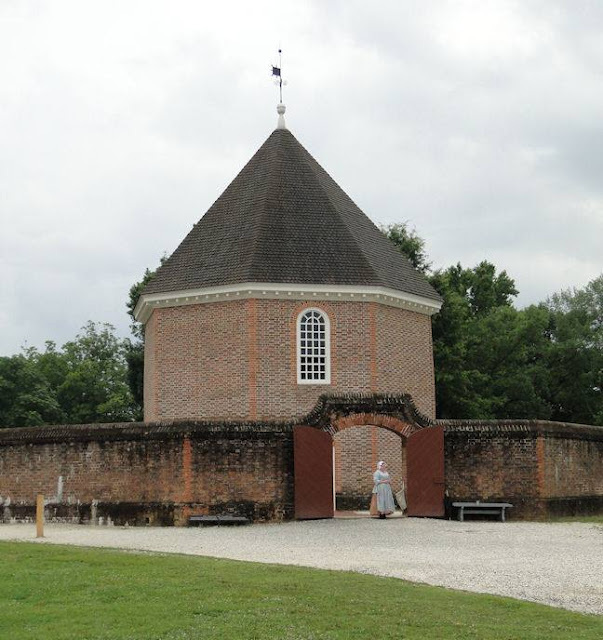 When Blair died in 1733, young William took over ownership and purchased shares of the business. 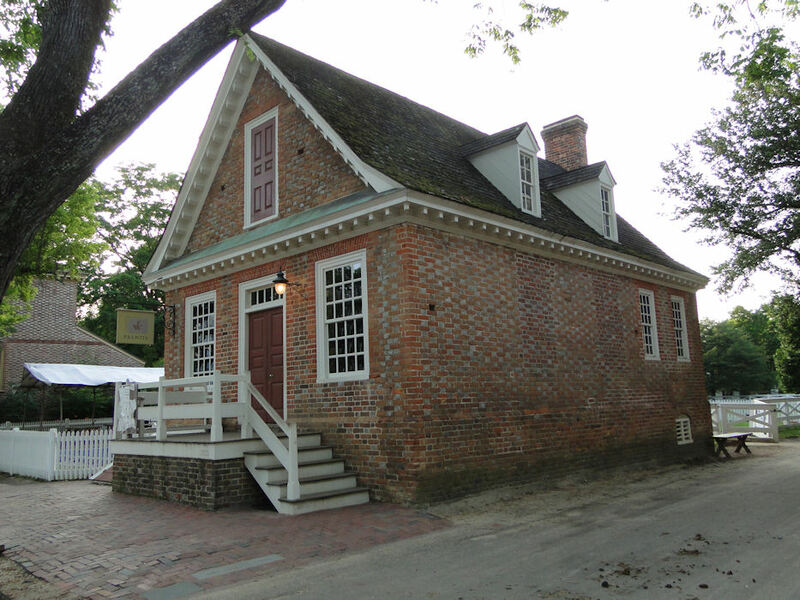 The modest brick facade known as the Prentis Store was completed and opened for business in 1740. Just think...this structure has been standing on the corner of Duke of Gloucester Street and Colonial Street for going on nearly 300 years! 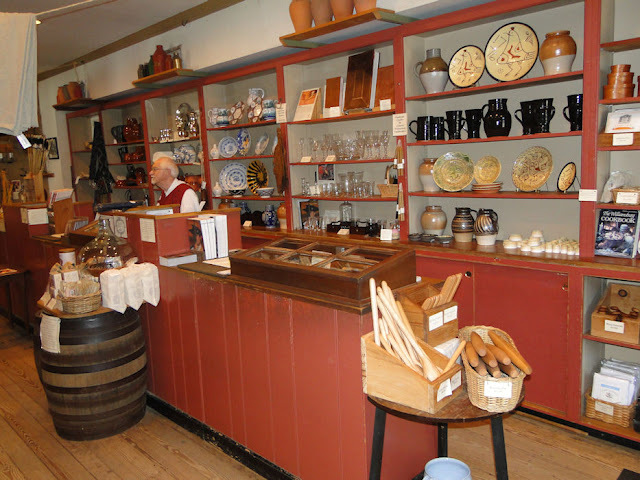 Mr. Prentis renamed the store William Prentis and Company and was originally stocked with items such as pottery, textiles, tools, toys, and other goods for daily life in Williamsburg. 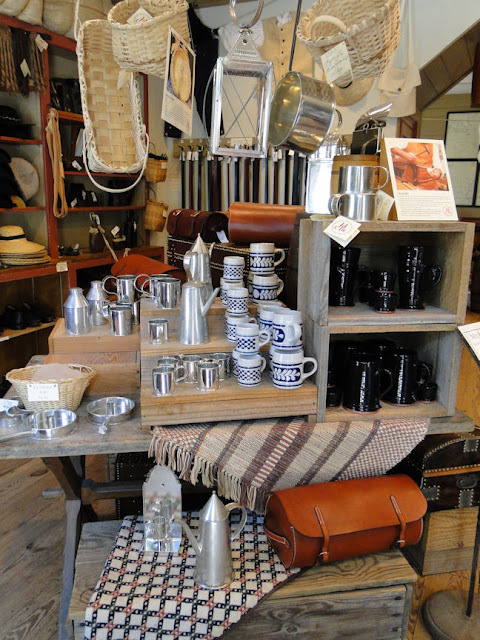 Hand crafted unique merchandise, many made by the skilled tradespeople of Williamsburg using 18th-century tools and techniques, plus men’s apparel and Native American pieces, are now sold here. There's not much of a difference in product in the last 250 years, is there? There were so many pieces to choose from. Yes, quality items not made in China, but right here in Williamsburg! 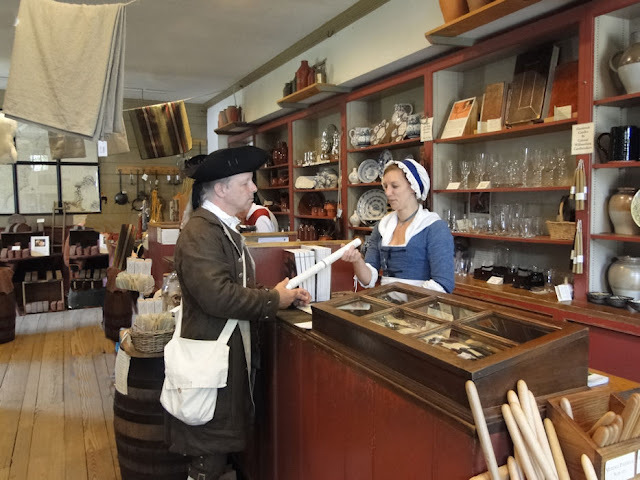 Shop keepers dressed in period clothing continue the 1770s atmosphere even while working behind the counters at souvenir stores, which adds greatly to the immersion experience. 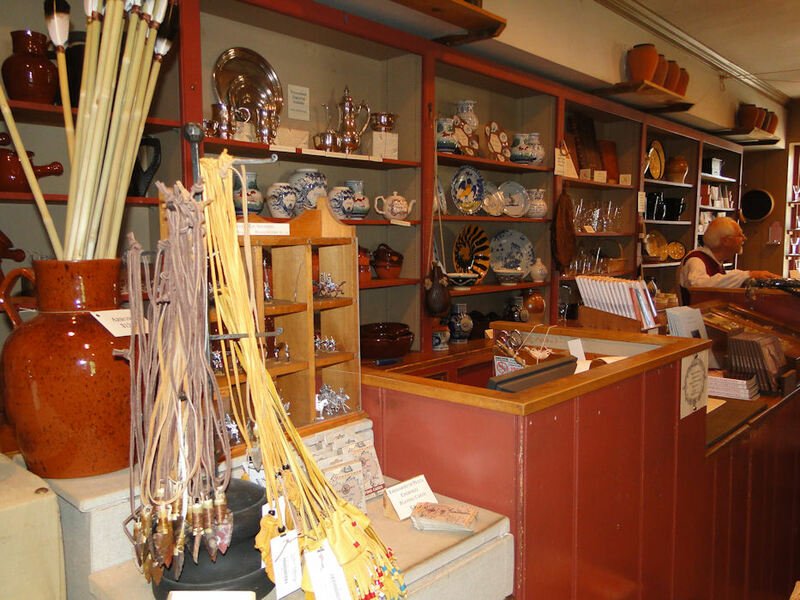 As is written in the Making History blog: "(Merchants) in Historic Area shops sell merchandise, but their role is anything but ordinary retail." After Prentis died in 1756, the business remained in the family, where it went to John Prentis that same year and then to Robert Prentis in 1775. 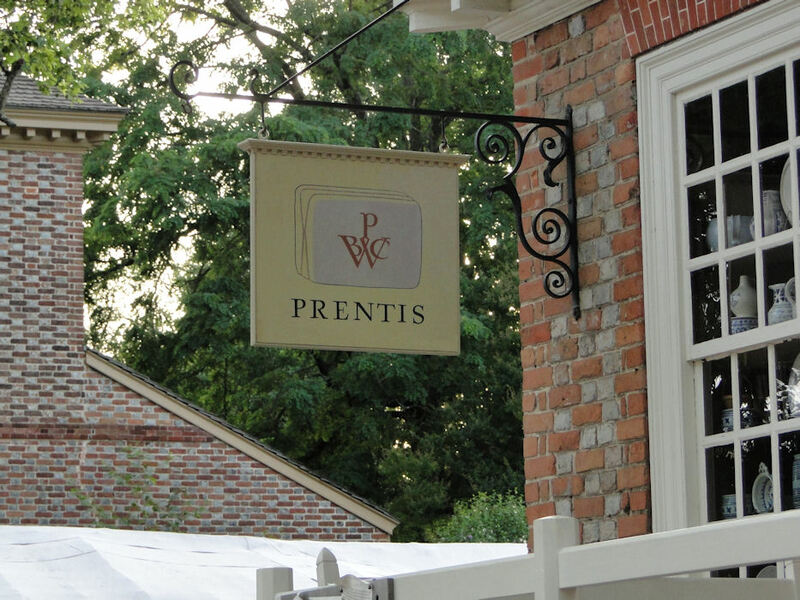 The Revolutionary War created a troubled economy for businesses in Williamsburg, including the Prentis Store. It was in 1779 that Robert closed up shop. This is when, after 46 years, the ownership of the Prentis family came to an end. Robert placed the building up for rent and moved to Trinidad in the West Indies. Remember what I just wrote about interactions with passersby? One of the wonderful things about Williamsburg is the willingness of the presenters to converse almost at the drop of a (tricorn) hat and to pose in such ways as to make the photograph (and scene itself) like a window into the past. Amy is one such presenter. And did we have a talk! 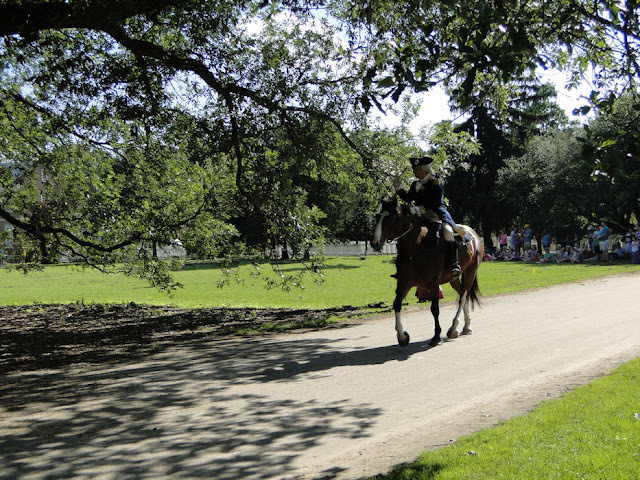 You see, at some of our reenactments in Michigan, I present myself as Paul Revere in hopes of teaching visitors the truth about the man - good and bad - over the fiction from Longfellow's poem that so many feel is correct. "You, sir, are Paul Revere?" "Yes, ma'am, at your service." "What are you doing in Williamsburg?" 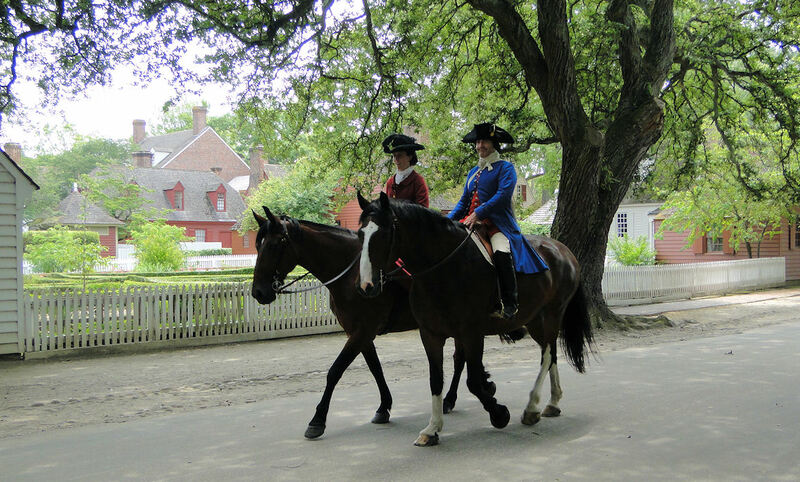 No, Paul Revere, as far as I know, never visited Williamsburg. 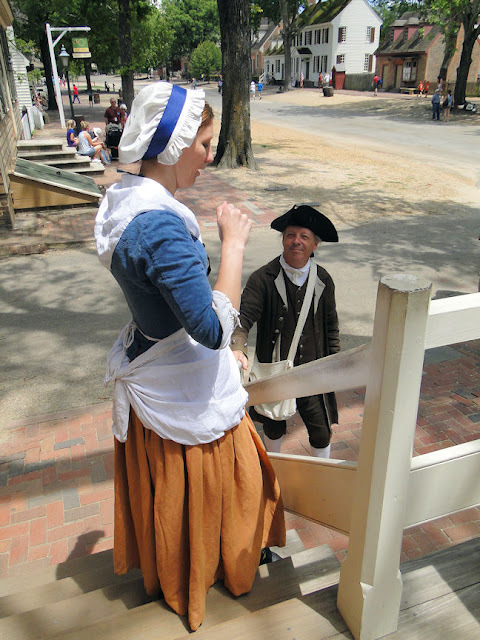 And, except for one occasion, I never presented myself as such to the modern visiting public while I was there (and that one time I did I made sure the modern visitor knew that there was no proof on Mr. Revere ever being there). 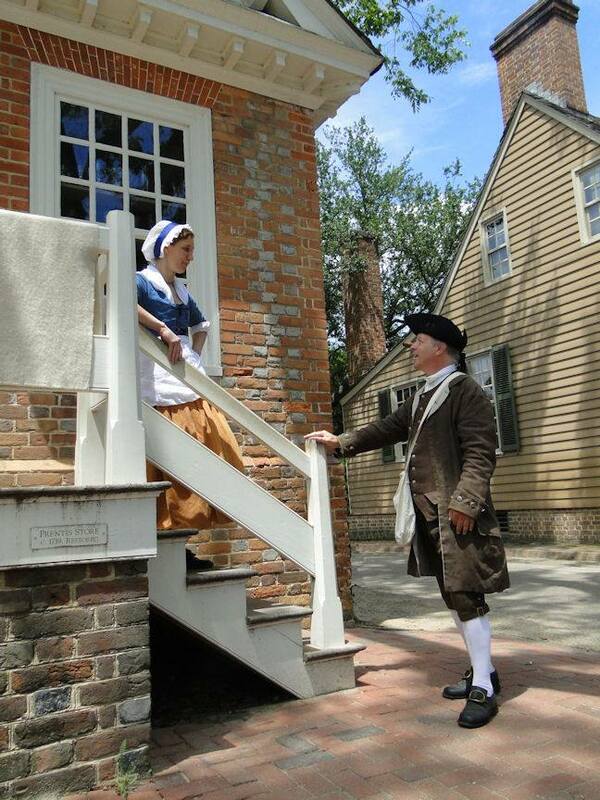 But, the discussions about Revere between Amy and I were very interesting in every sense. As we bantered back and forth, it became apparent that the two of us, though knowledgeable in our facts, agreed to disagree in our opinions of "my" actions in Boston. 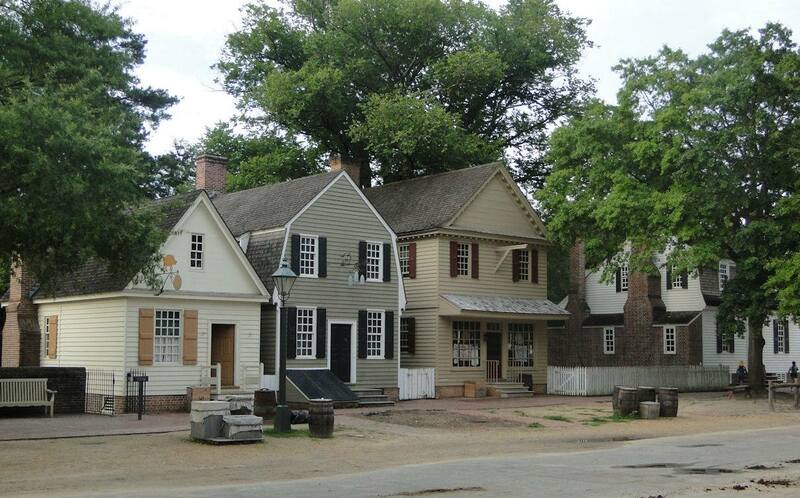 I had the feeling that the occurrences that took place in New England in the early 1770s were not received favorably to the citizens of Williamsburg. 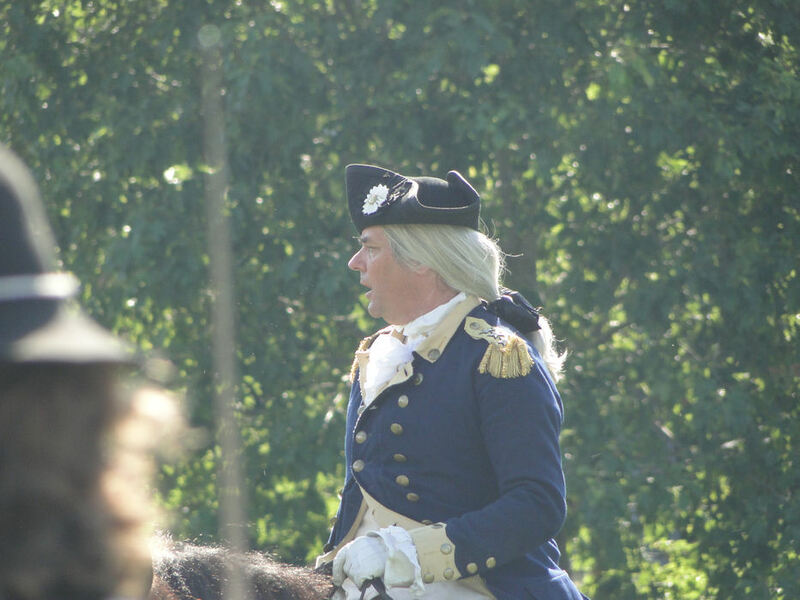 I heard more than one Virginian (including Mr. Washington himself!) state that New Englanders were "rabble rousers" in favor of starting a war with the King. Of course, it didn't take long for the citizens to join in the movement against the Crown. Amy is a very well-read student of history and I enjoyed our discussion about the causes leading up to the Revolutionary War, including her deep knowledge of the Stamp Act of 1765. Thank you to the unknown photographer who was very willing to take the photographs you see here of Amy and I. When I asked this passerby, she happily took my camera and shot away. The best part is that she seemed to be a professional photographer and took pictures from varying angles. Thank you again to this very kind woman. These are among my most favorites. 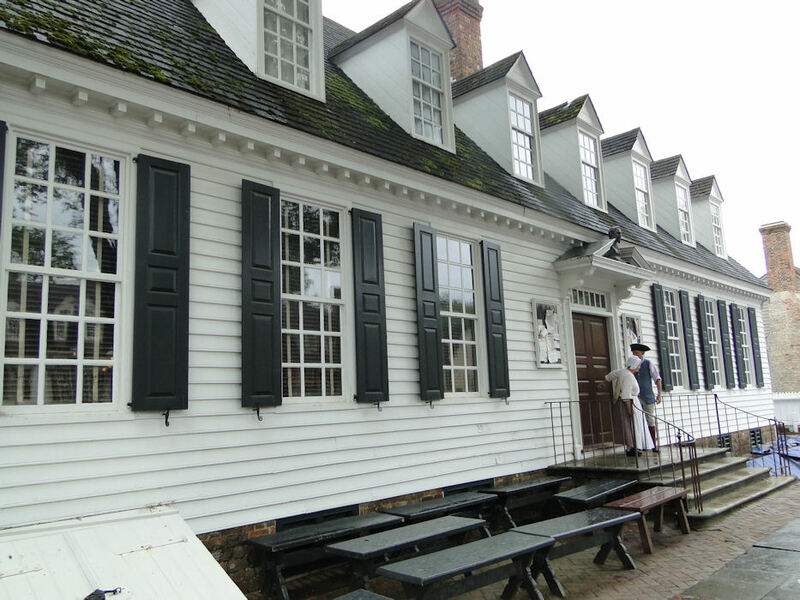 Just down the road a-piece is the Raleigh Tavern. Facing east, we see the Capitol at one end of Duke of Gloucester Street. 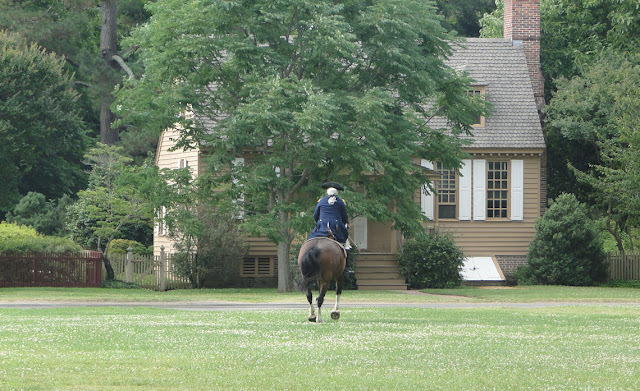 On the left, here, is Raleigh Tavern. This is one majestic building! 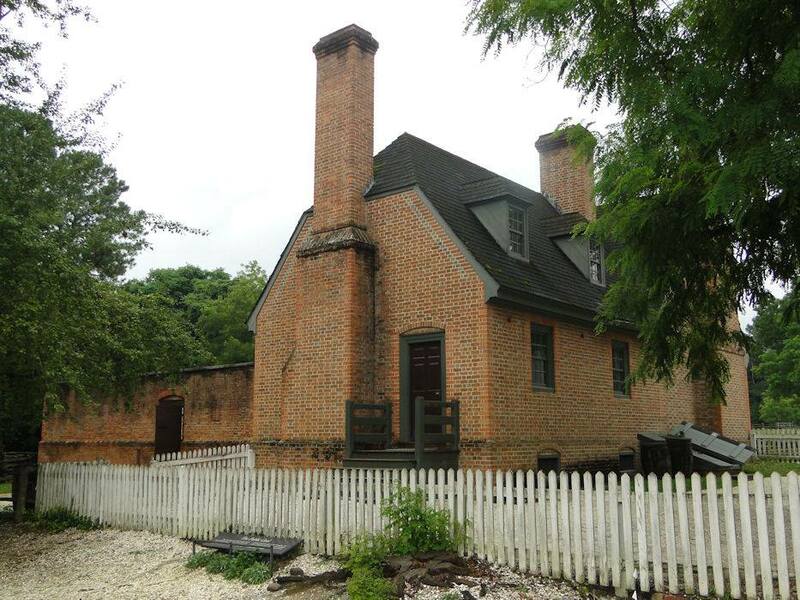 The original building was erected in 1717 and was destroyed by fire in 1859. Inside the Raleigh, balls were held, the House of Burgesses reconvened here after Governor Botetourt dissolved the chamber for disrespect due to their protest against the Townsend Acts, slaves were auctioned on the tavern steps, and the Phi Beta Kappa was founded in 1776 in the Apollo Room. 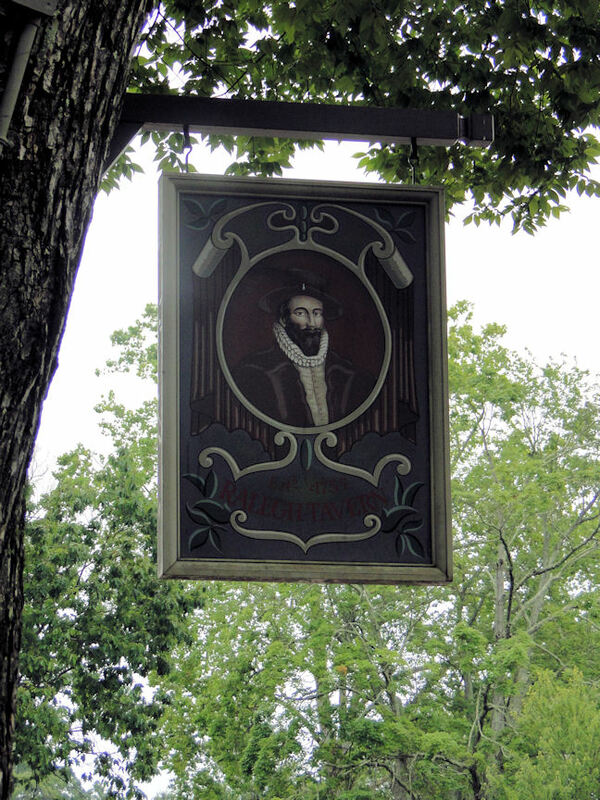 The Raleigh Tavern was named for Sir Walter Raleigh,who had attempted the first colonization of Virginia in 1585. 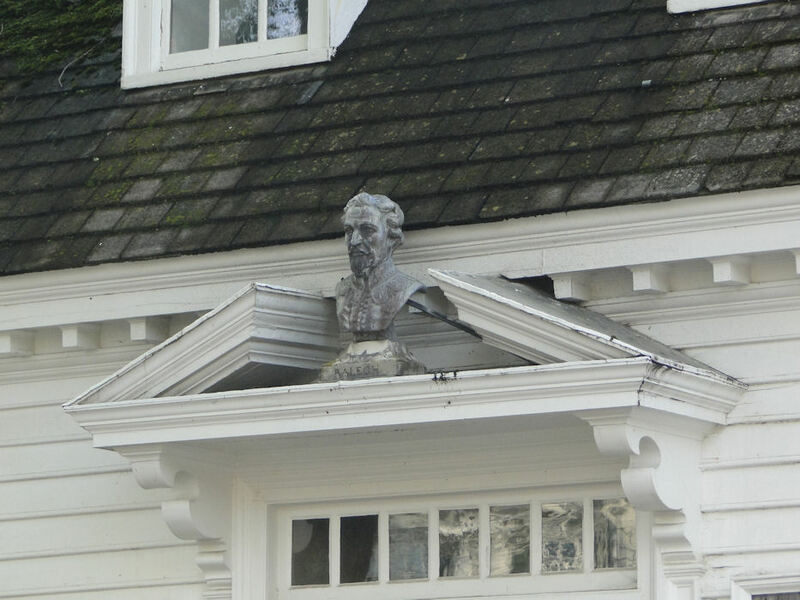 A lead bust "stood above the door" such as what you see here. The original disappeared after the 1859 fire, but this replica certainly gives the building a unique look. For reasons I can't explain, I never did enter the main floor of the Raleigh, and I'm kicking myself for not doing so. All the more reason to go back, right? I did, however, go into the bakery in the back to purchase some ginger snap cookies and the oh-so-good Chowning Root Beer. The freshly baked bread just out of the oven. And how are your hearth-cooking skills? I can't speak for the bread, but the ginger snap cookies were excellent! 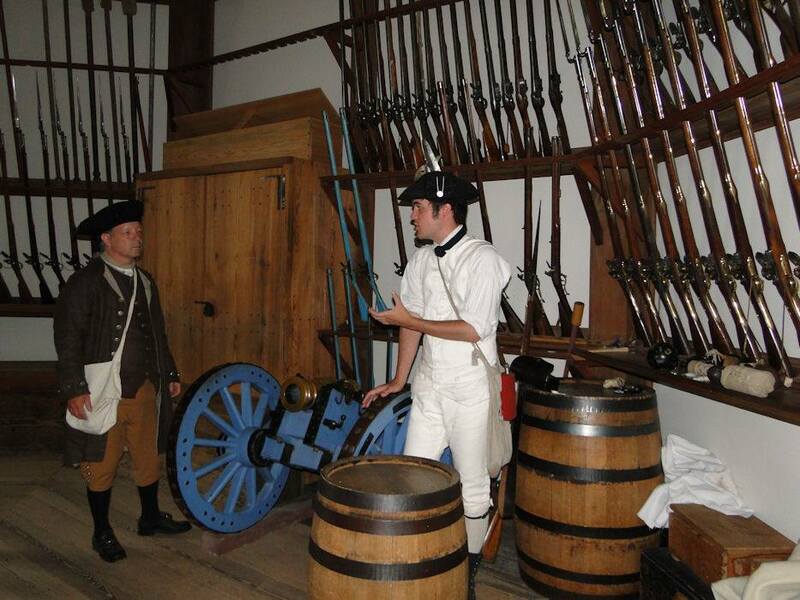 At reenactments, we try to show a few of the crafts that people did in the past during our events. For instance, my wife spins on her spinning wheel quite often, and in the fall I will make candles. I have read that candle-making was a chore that was practiced by most folks who lived in the 18th century. But while in Williamsburg I was informed that most "city" dwellers did not make candles, for they had too many other chores to keep them busy. Twas easier to buy them from the local chandlers, or candlemakers, who made a living making and selling (or bartering) candles. We had off-'n'-on light rain showers on the Tuesday we were there, and because of the wet weather, the chandlers were not able to perform their craft. But I happen to find them spending their "day off" collecting wood needed for future fires at their shop. Yep---there goes Ken again, making conversation with the Williamsburg workers. But it was during the conversation here that I learned about the importance of chandlers in a busy city. 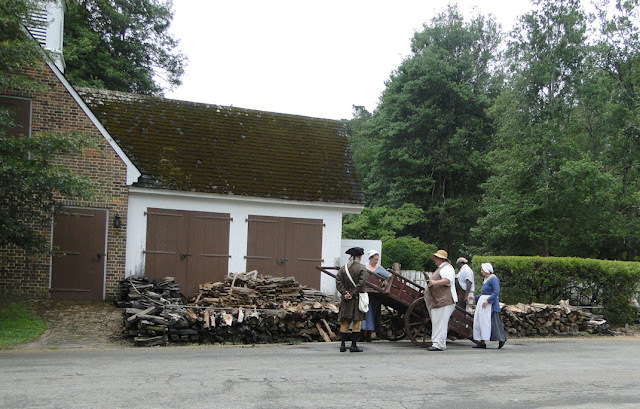 By the way, kudos to Williamsburg for using period-correct transferring tools (such as an 18th century-style wheel barrow) rather than a golf cart or some other modern form of transportation for deliveries (as I have seen elsewhere). Keeping it real for history. So, being that the following day was filled with bright sunshine coming down from a cloudless sky, we ventured over to the property once belonging to Charles Taliaferro (hey! An Italian in colonial America! You don't see that too often!). 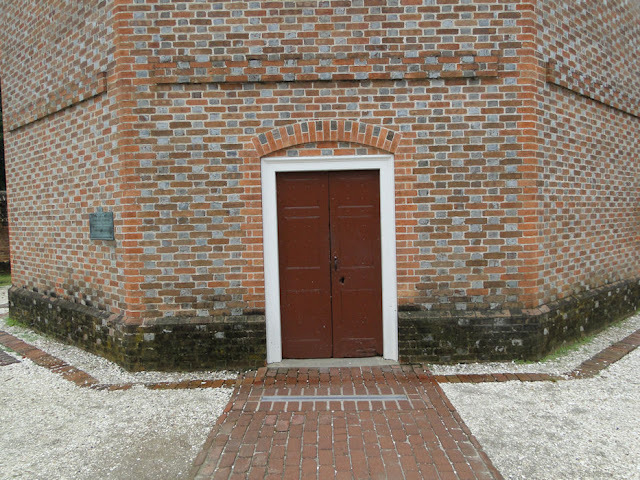 Now, I am ashamed to say I never went inside this little saltbox (or breakback, as it was called then) building where, I hear, the joiners, who are a type of carpenter that make windows, doors, moldings, and other trims, are located. And I am greatly disappointed in myself because, as strange as this may seem, the coffin out front should have been a clue to enter. Yes, I am fascinated by 18th and 19th period mourning practices. 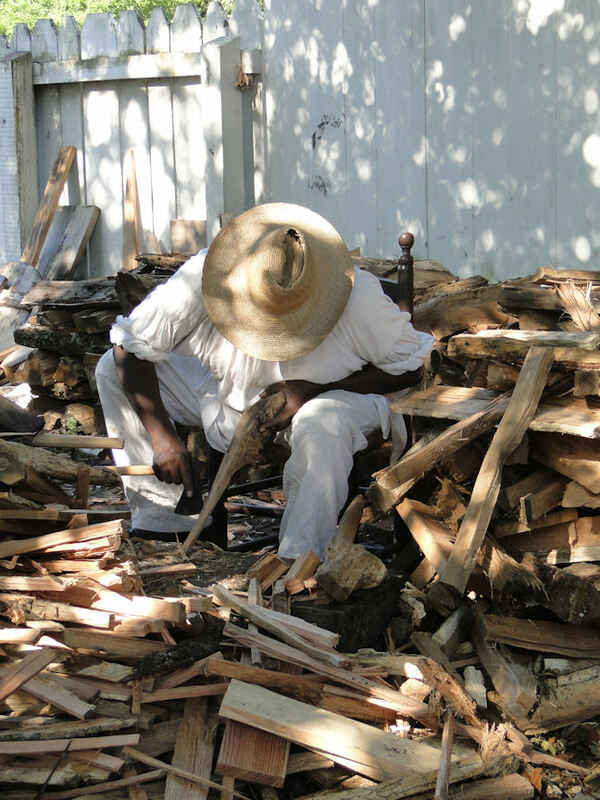 I also very much enjoy watching the talent of wood-workers. Yep---we will definitely need to return! 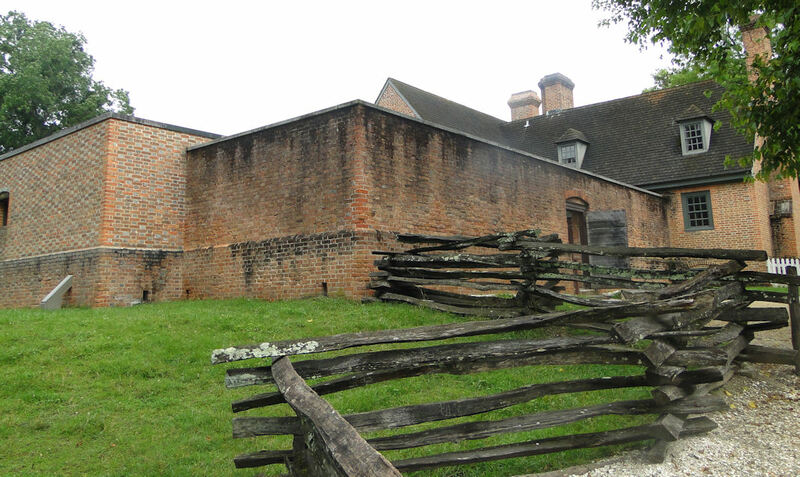 In the 18th century, this sloping roof architecture was known as breakback-style. 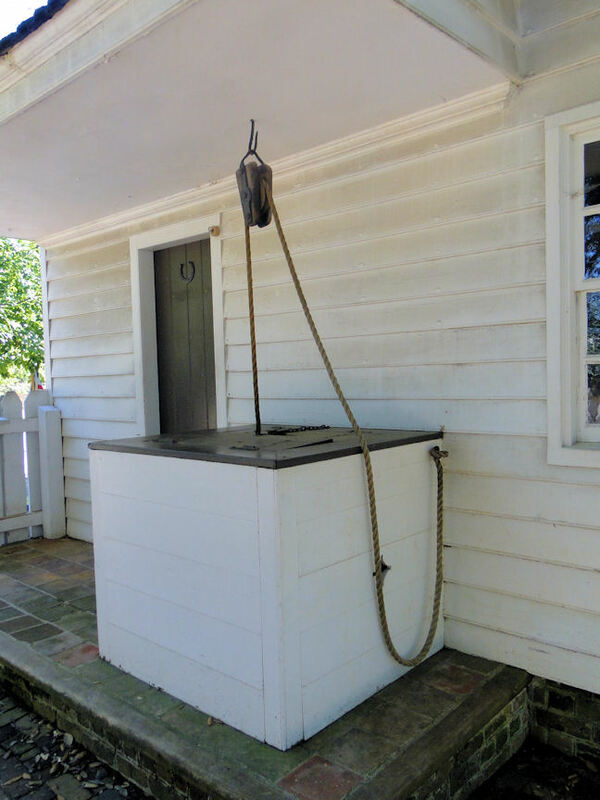 Today we call it a saltbox house because of the similarity in shape to the small chests used for storing salt at that time. Founding Father and our 2nd President, John Adams, was born in a house with this breakback shape. 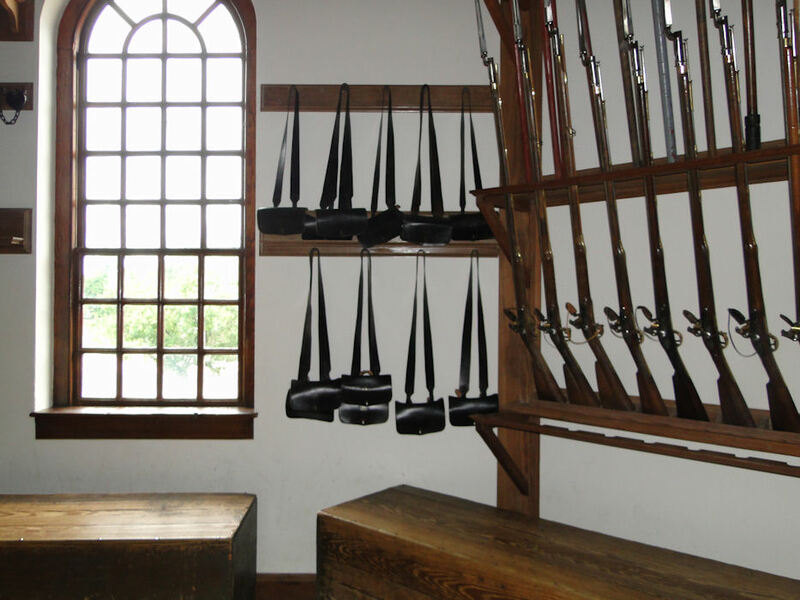 It was very popular throughout the 13 colonies in the 1700s, but most popular in New England. But what's this I see behind the Taliaferro Shop? It's where we find the Chandlers hard at work! 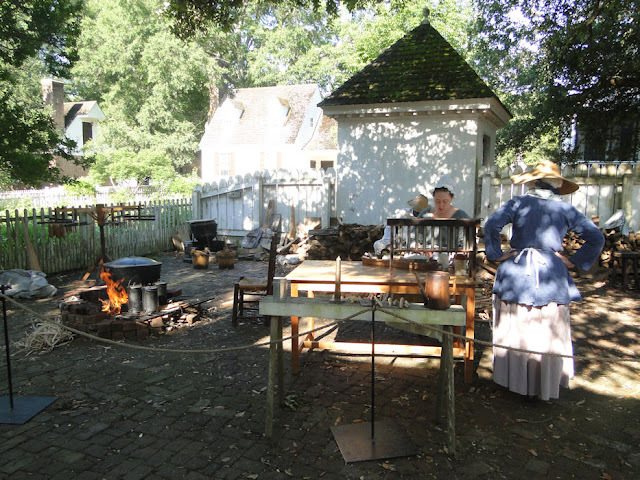 Candlemaking was not the fun hobby in colonial times as it has become in our modern era — in the home it was a labor normally assigned to the housewife and children, taking place usually in the coolness of the fall after butchering and cooking of meats was completed. But for those who chose to make candles as a commodity, it was a job. And it was a backbreaking, smelly, greasy job at that. Candles were made of animal fat or beeswax. Those who made candles in the home generally used animal fat, with every scrap needed to be collected and prepared. Beeswax, however, had a sweeter honey smell. Unfortunately, beeswax was not always available in large quantities in many places, for it was expensive, and usually only the very rich could afford to use candles made from it as a daily way of lighting their homes. You see, unlike animal-based tallow, beeswax burned pure and cleanly, without producing a smoky flame. It also emitted a pleasant sweet smell rather than the foul, acrid odor of tallow. But, in colonial America the early settlers discovered that they were able to obtain a very appeasing wax by boiling the berries from the bay-berry shrub. This wax created a very sweet smelling and good burning candle; however the process of making the bayberry wax was very tedious and tiresome. Plenty of wood was needed to keep the fires going the day long to keep the wax melted. 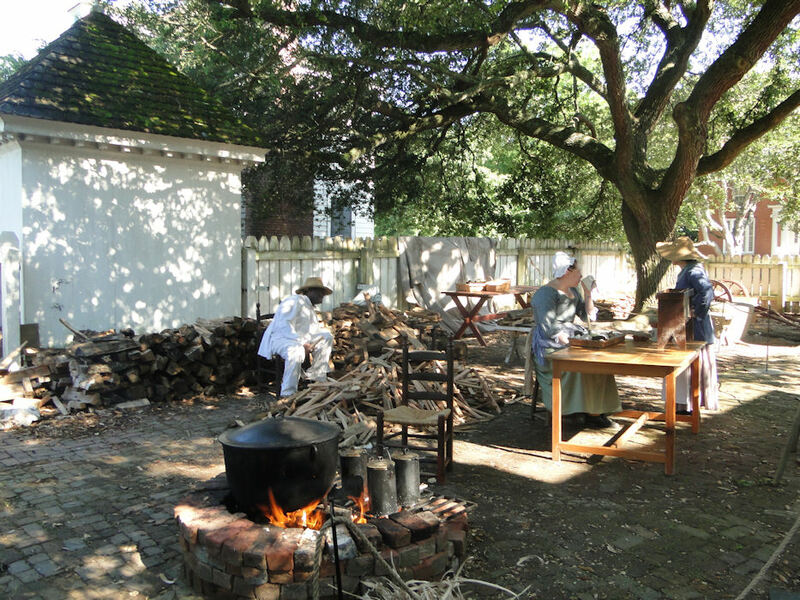 According to one source, a typical middle class home in the 1750's would go through nearly 500 candles a year. And that may even be a conservative view - it would not be a surprise if many homes went through at least a third more than that! Tin molds allowed the chandlers to make candles in far greater quantities than dipping. Of course, that also depended on how many molds a chandler had. 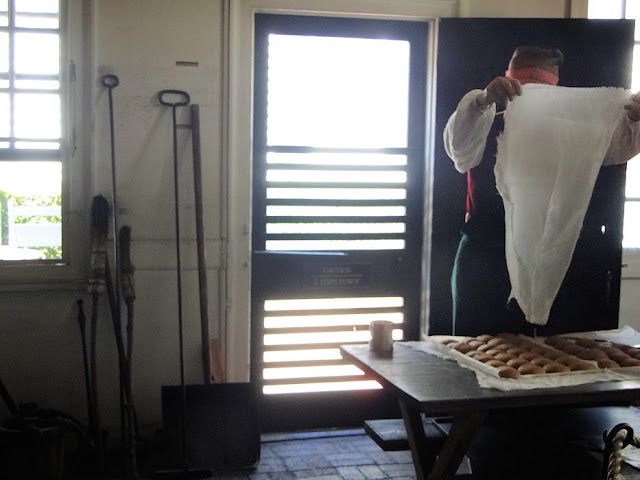 For such a place as Williamsburg, I would imagine there were plenty of these molds about, filled continuously for the working people of the city. The growth of the whaling industry in the late 18th century brought the first major change in candlemaking since the Middle Ages, when spermaceti — a wax obtained by crystallizing sperm whale oil — became available in quantity. 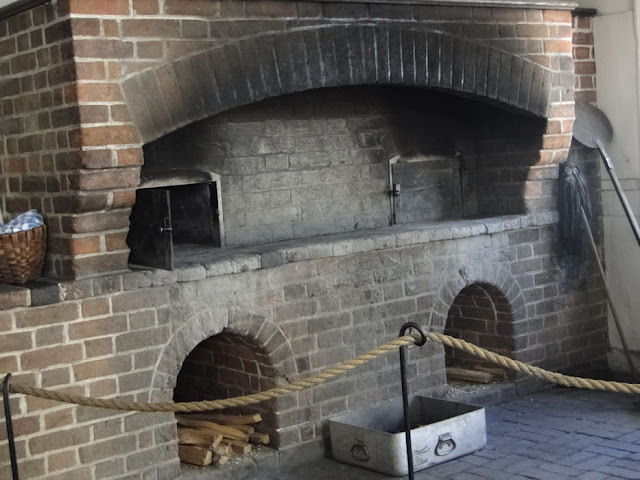 Like beeswax, the spermaceti wax did not elicit a repugnant odor when burned, and produced a significantly brighter light and was used as a replacement for tallow, beeswax, and bayberry wax. The tinderbox you see here would have flint or steel (anything that can create a spark) and "tinder" to be lit such as dried grass, stick slivers, or hay. 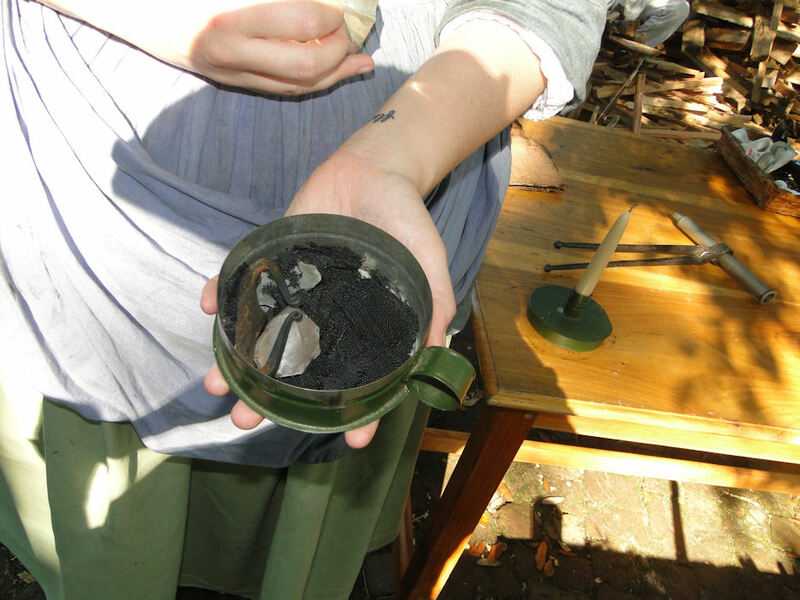 Tinderboxes were very popular in the 18th century and, since the 'fuel' could be contained easily and kept at hand, it was the preferred method of lighting travel. 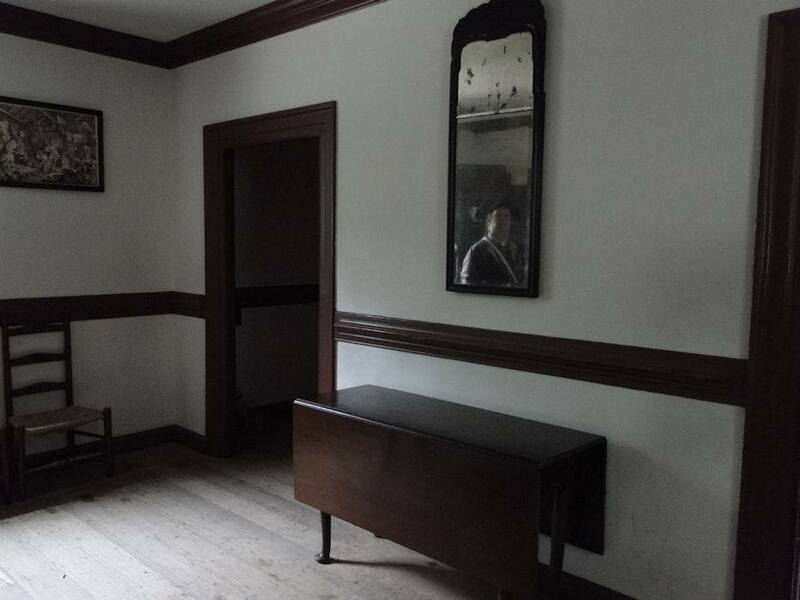 Though a part of daily life for city dwellers like those who lived in Williamsburg, artificial light in the 18th century was a luxury for the many people who lived in more rural areas. 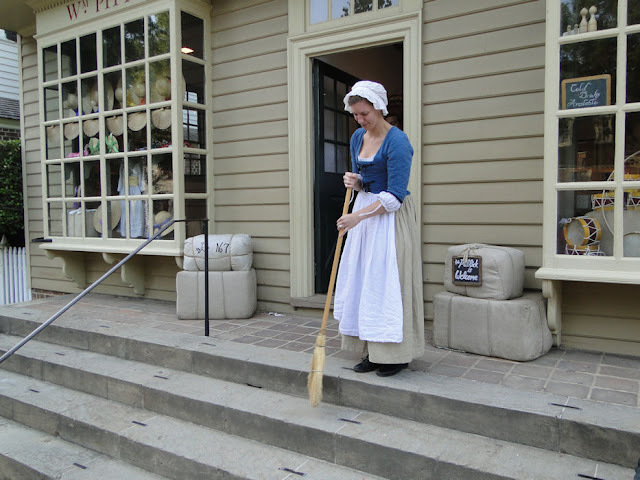 But whether city or country, people were generally used to working by daylight, so lighting a candle while the sun was up was considered wasteful and not done very often. 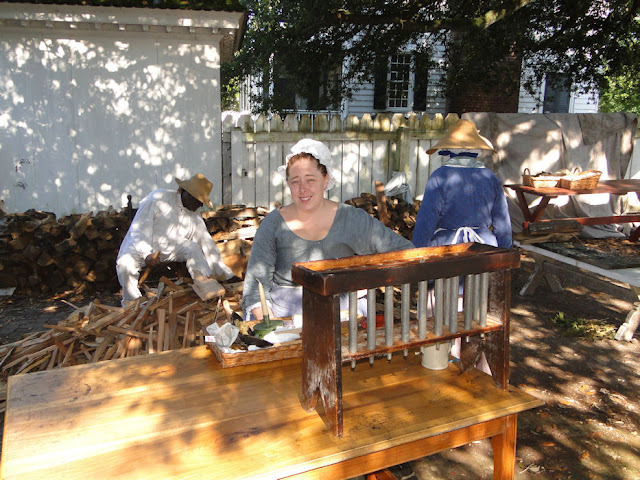 I very much enjoyed visiting the candlemakers at Williamsburg. Like those who worked trades in other areas of town, they were informative and happily answered our questions. Best of all, I learned something new! 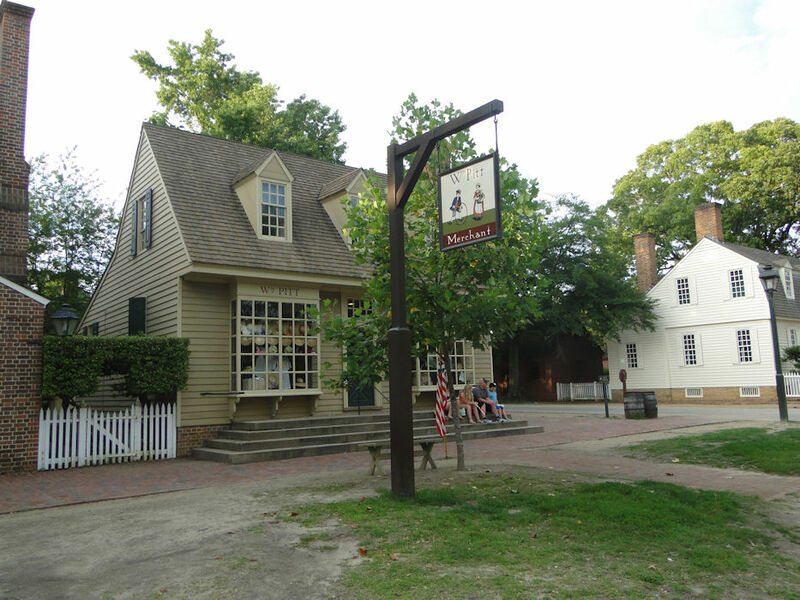 If I do happen to make it back to Colonial Williamsburg, this is one area I plan to spend a bit more time at. 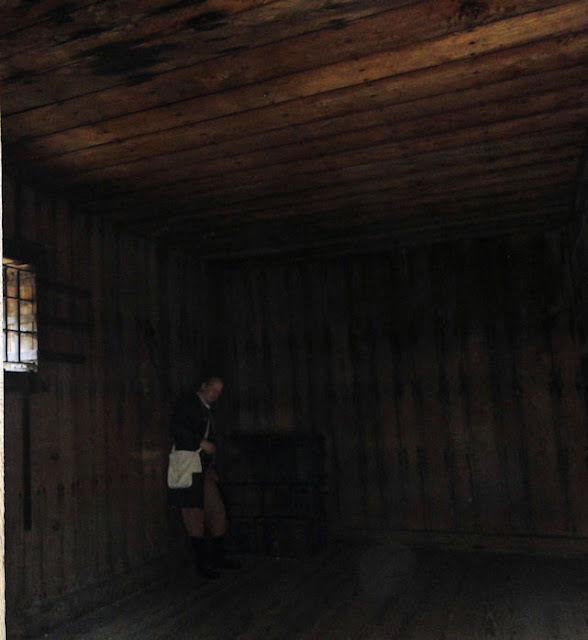 The public gaol - or jail - which opened its doors for criminals for the first time in 1704, was another must see for us. I've read quite a bit about this gaol (the colonial spelling for jail) and had a keen interest in visiting. The Public Gaol in Colonial Williamsburg: just visiting. 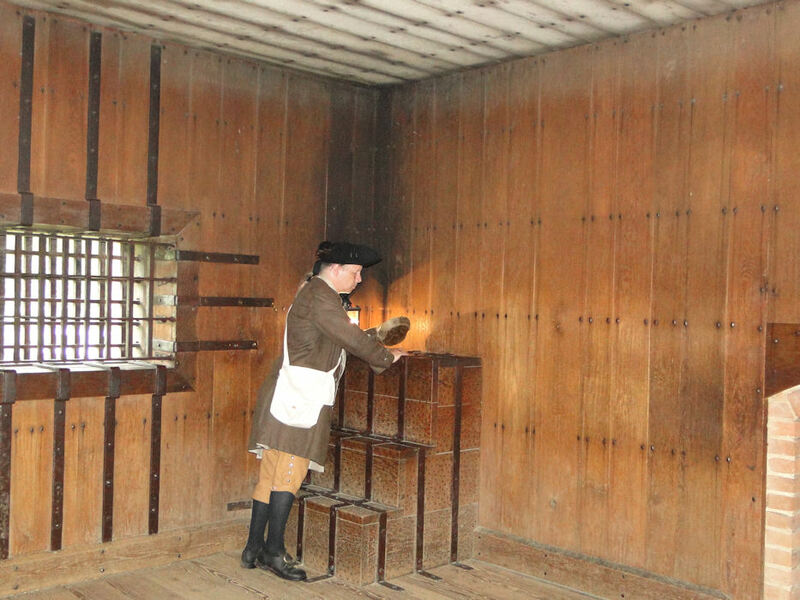 Most occupants were men and women awaiting trial in the General Court or convicts waiting to be branded, whipped, or hanged, according to their sentences. Though sentences were harsh by modern standards, first offenders might expect mercy, and some "miscreants" (people who were thought to be wicked or perverted) were merely fined. In any event, the Gaol was not intended for long-term imprisonment. I'm not a hundred percent sure which part of the gaol this is - my wife and I recall being told this is the area in which the inmates were first brought in. An interpreter left a comment stating it was the gaoler's home. Yes, that's me in the mirror. It's almost spooky, isn't it? 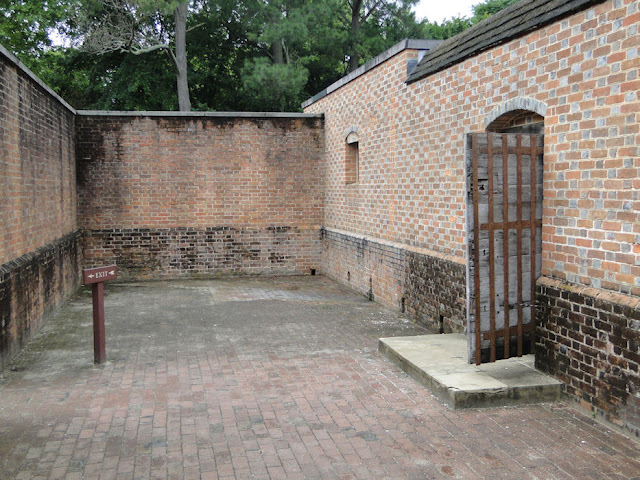 Debtors, runaway slaves – and occasionally the mentally ill – were sometimes confined in the Gaol. During the Revolution, tories, spies, military prisoners, deserters, and traitors were included in the prisoner inventory. Okay, I'll tell you...I am looking at the necessaries - the toilet bowls (now cleaned!) for the prisoners! Little holes inside the wooden blocks. 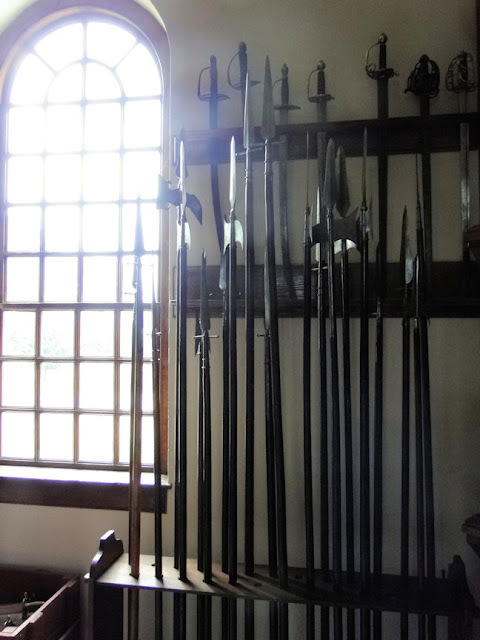 Imagine what these room smelled like on a hot summer's day! The Public Gaol's most celebrated occupants were 15 henchmen of the pirate Blackbeard, caught in 1718, and the infamous Henry "Hair Buyer" Hamilton, lieutenant governor of British Detroit, captured in 1779. 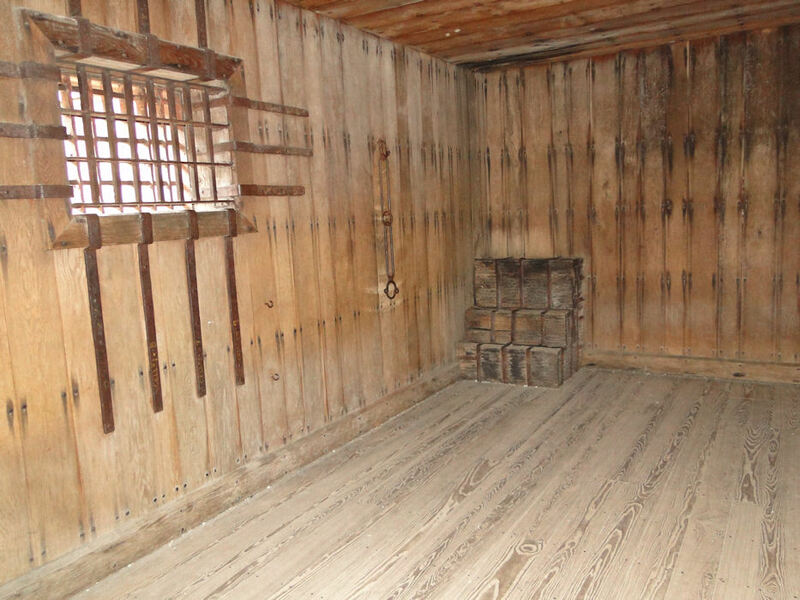 Suspected of buying pioneer scalps from Indians, Hamilton was held in a straw-strewn 10-foot by 10-foot cell with six other inmates. I was mistaken as the "hair-buyer" and put in chains in the dimly lit room. They soon realized that I was not the famed lieutenant governor of British Detroit (even though that is where I travel from) and I was soon set free. "In one corner of this snug mansion," Hamilton wrote, "was fixed a kind of Throne which had been of use to such miscreants as us for 60 years past and in certain points of wind renderd the air truly Mephytic. Opposite the door and nearly adjoining the throne was a little Skuttle 5 or 6 inches wide, thro which our Victual was thrust to us." Is that the "throne" in which Hamilton the Hair Buyer was speaking? Ha! And we still call it that today! 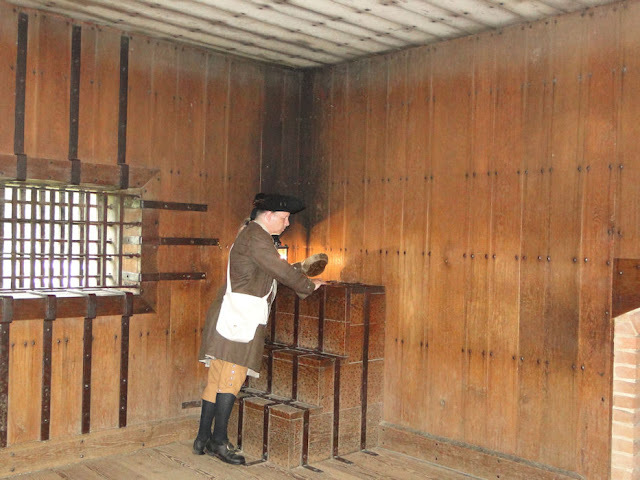 The Public Gaol appears today as it did after the renovations of 1722, with eight cells, an exercise yard, a courtyard, and rooms for the gaoler. The Gaol became a county facility in 1780 and, much modified over the years, served until 1910. The restored building was dedicated in 1936. 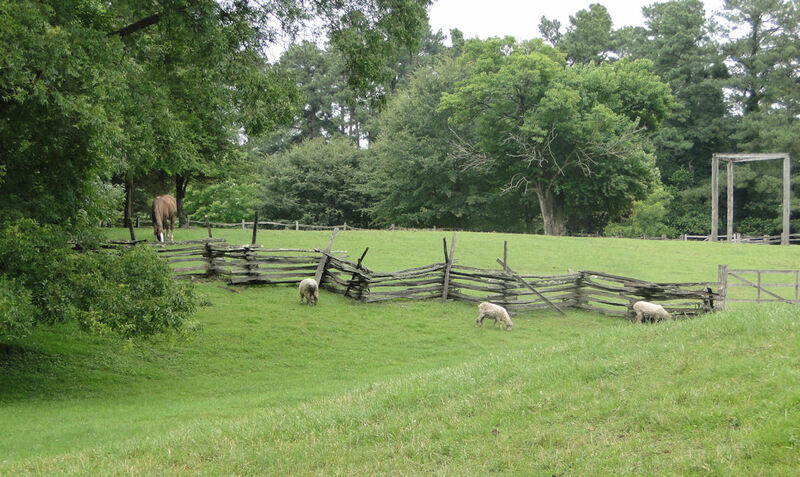 Directly behind the gaol was this beautifully pasture of land with horses and sheep grazing peacefully. I'm not sure, but is that the hangman's gallows in the background there? 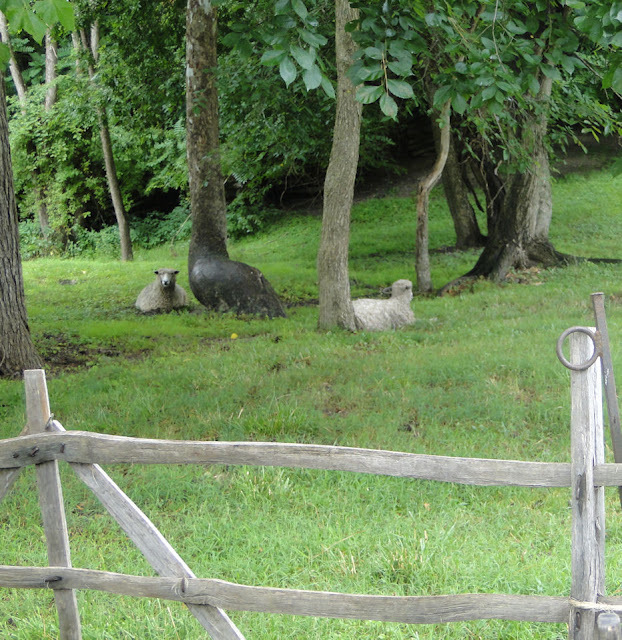 My wife, a spinner, loves sheep, so I take photos of them whenever and wherever we may be. Continuing on our journey throughout the Revolutionary City, we head to the magazine. 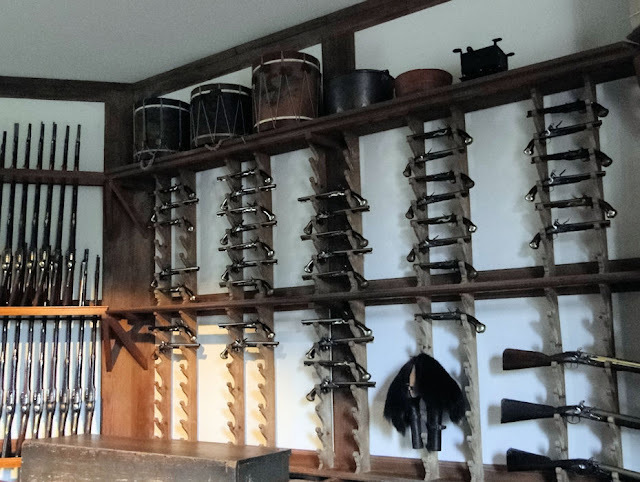 Magazines, which held the gunpowder and other explosive implements of war, indirectly played a major role in the start of the Revolutionary War. It was the British Regulars who were marching into towns and villages and cities to purposely take the armaments of the citizens. 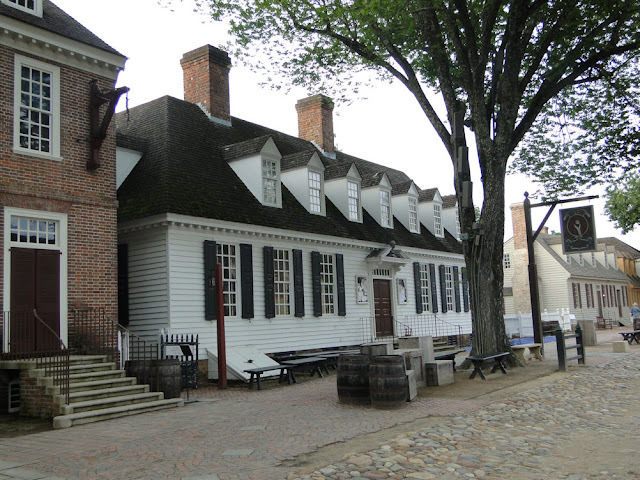 It happened up north in Massachusetts - just ask Paul Revere about that (click HERE and HERE if you are unaware of this bit of American history) - and it happened in Williamsburg. The Magazine, constructed in 1715. 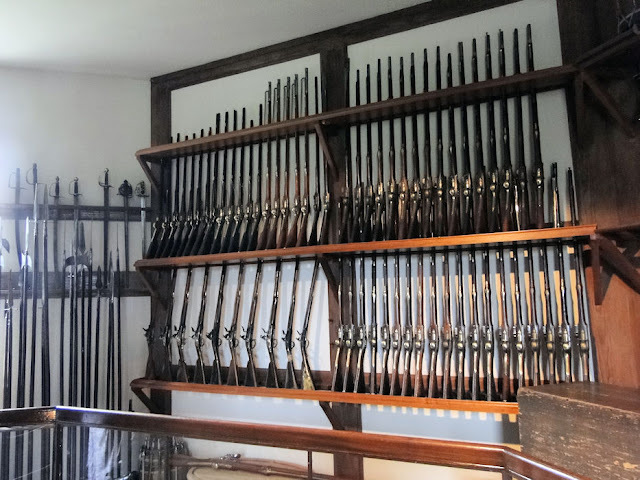 Here was Williamsburg's arms storage facility. The wall was added for extra security during the French & Indian War as large amounts of powder and arms were stored here. 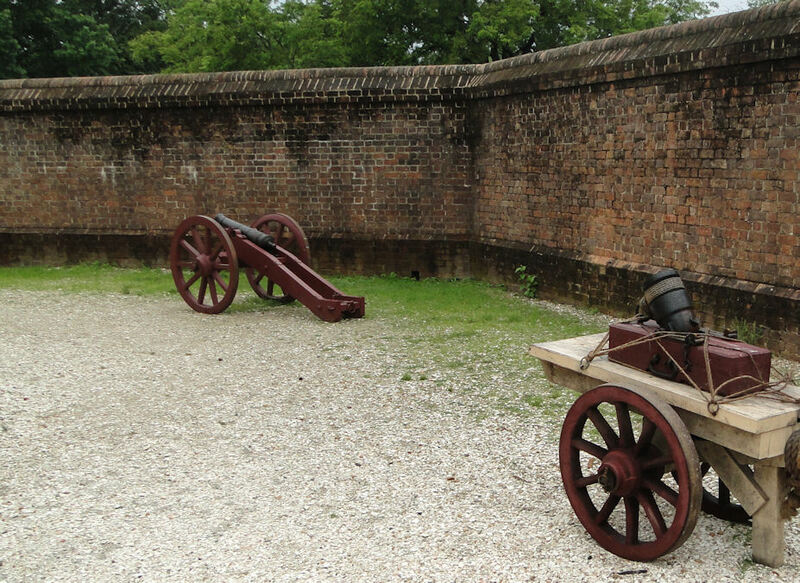 Just inside the walls sits a cannon and a mortar. The entrance to the Magazine. ...on April 20 of 1775, as tensions mounted even before the actions that took place at Lexington & Concord reached Virginia, Governor Dunmore had the colony's 15 half barrels of gunpowder removed to a British warship. 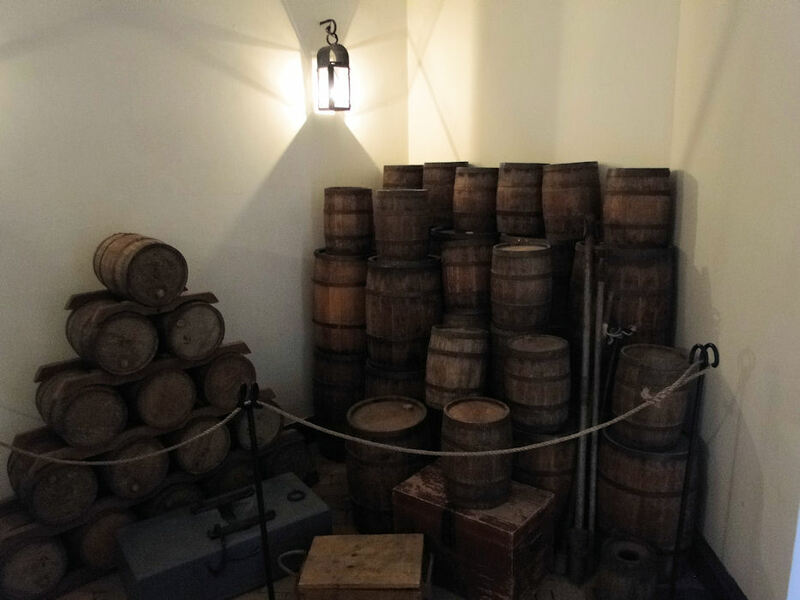 Barrels of gunpowder in the Magazine. Dunmore knew full well that possession of the gunpowder was the possession of power. 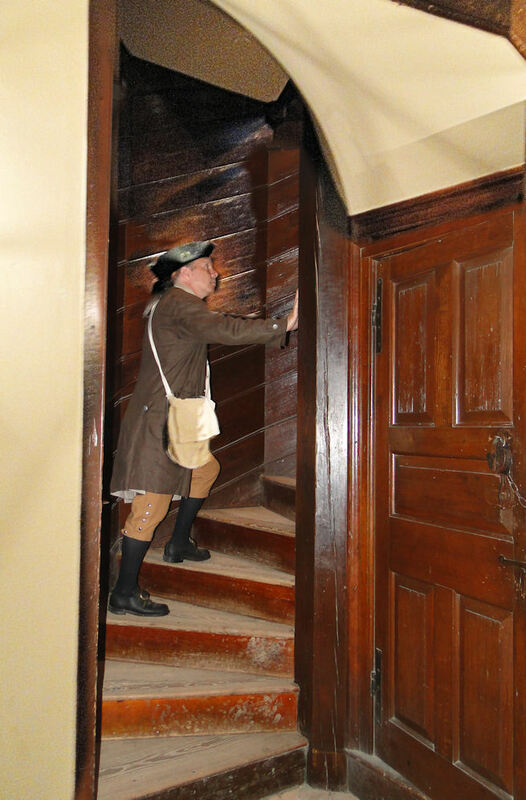 Heading up the stairs where we find a good example of what the magazine may have looked like during the time of the American Revolution. As the news of this quickly spread, most of Williamsburg's population gathered on Market Square, and some talked of doing Dunmore harm. Peyton Randolph, Robert Carter Nicholas, and Mayor John Dixon averted violence by persuading the crowd to send a delegation to the governor to demand an explanation. Dunmore said he had intelligence of "an intended insurrection of slaves" and only wanted to keep the powder out of its reach. Unless he viewed the angry patriots as slaves, he was lying. During the public outcry that took place, Patrick Henry and a party of armed volunteers demanded return of the powder or payment for it (which Dunmore promised he would). At St. John's Church in Richmond on March 23, Henry had risen during the Second Virginia Convention to argue for the organization of a volunteer company of cavalry or infantry in every county. His speech ended with "Give me liberty, or give me death." 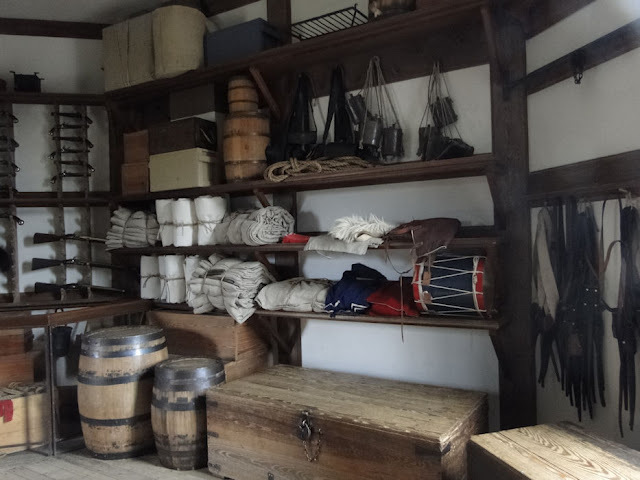 To be in and around the building where all of this took place at the beginning of America's fight for Independence---then add to this my visits to the homes of Peyton Randolph and George Wythe...well, as a student of American history, it does not get any better. 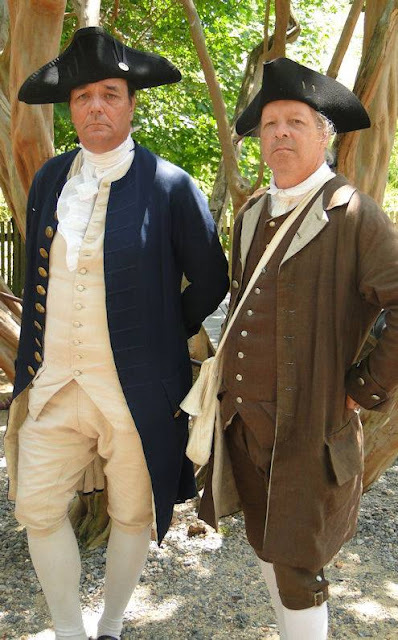 Word of Lexington and Concord reached Williamsburg on April 27. The Virginia Gazette got out a broadside the next day that said: "The Sword is drawn and God knows when it will be sheathed." 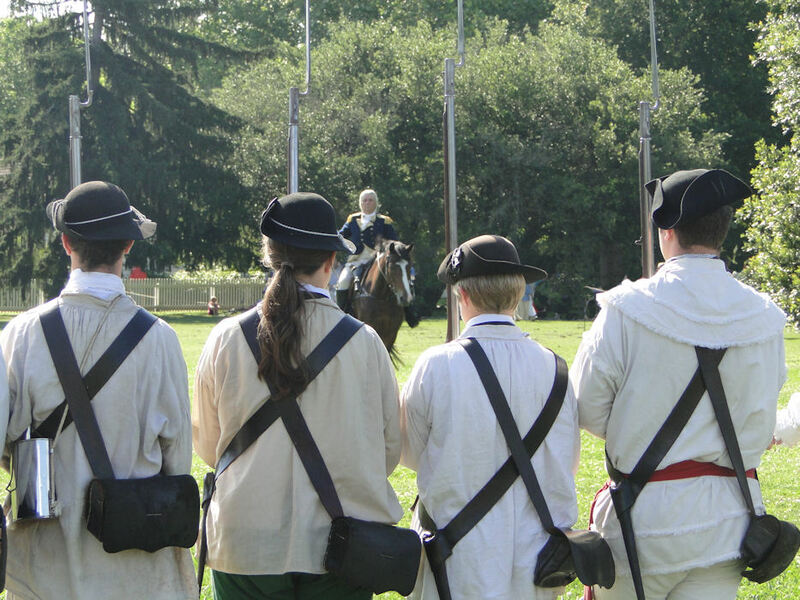 Soon Henry and 150 militiamen were threatening the capital from a Military Encampment just west of the city and demanding restitution for the powder. They were granted restitution. 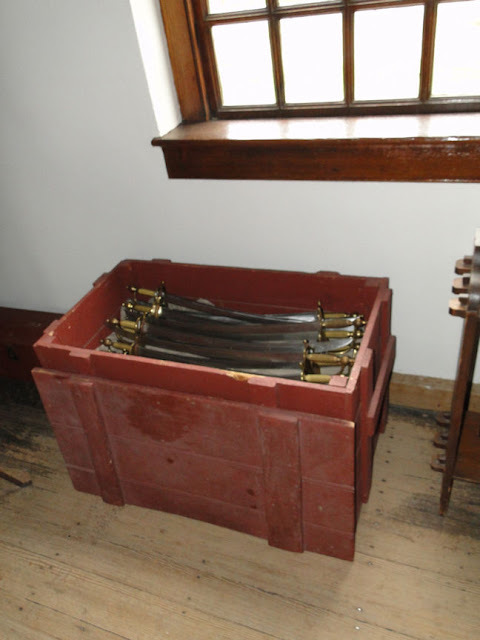 Late June 3 or early June 4, a spring-gun trap set at the Magazine wounded two young men who had broken in. A furious mob stormed the building June 5. Rumors that the royal marines were returning brought out the militia. June 8, Dunmore fled to H.M.S. Fowey, anchored in the York River. 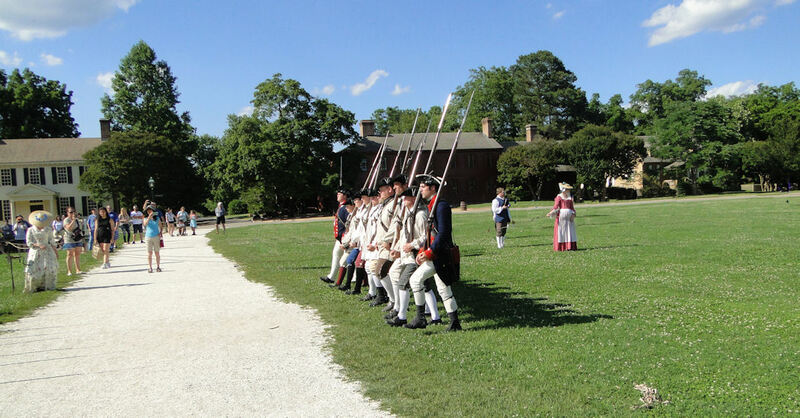 British rule in Virginia was at an end. Seriously, folks, I just got chills as I read here of the events back in 1775 and realizing I was on the very spot where this all occurred. So far I have seen (and met) Thomas Jefferson and Patrick Henry. Now it was time to become acquainted with Colonel George Washington. Okay...yes, we all know that everyone from the Founding Generation have been "moldering in their graves" for some-200 years now (give or take a few), and so are multiple generations of their descendants. 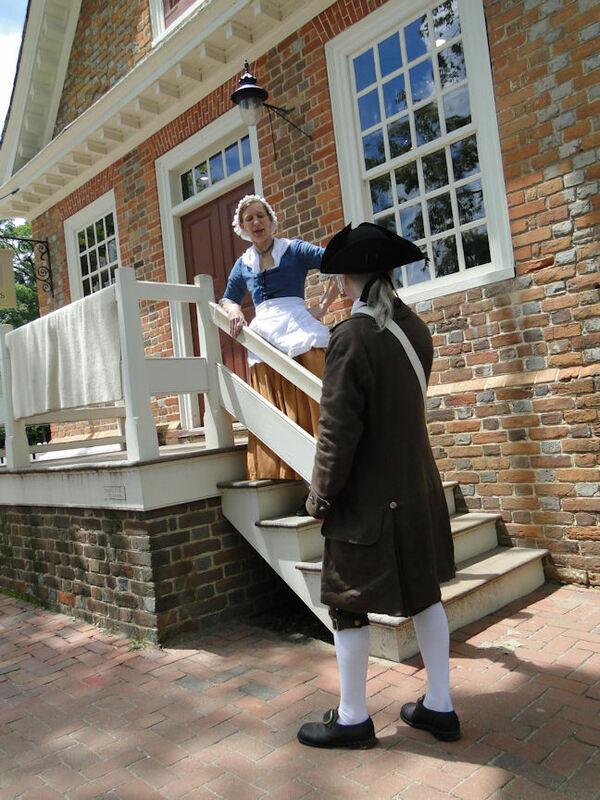 But witnessing the portrayals of the Founders as presented here is as close as we can come to meeting and understanding what these great men & women (for there are women who are part of Williamsburg's "Nation Builders") may have been like in their lives and time. We're used to seeing George Washington as he is pictured on the one dollar bill: old and stiff. 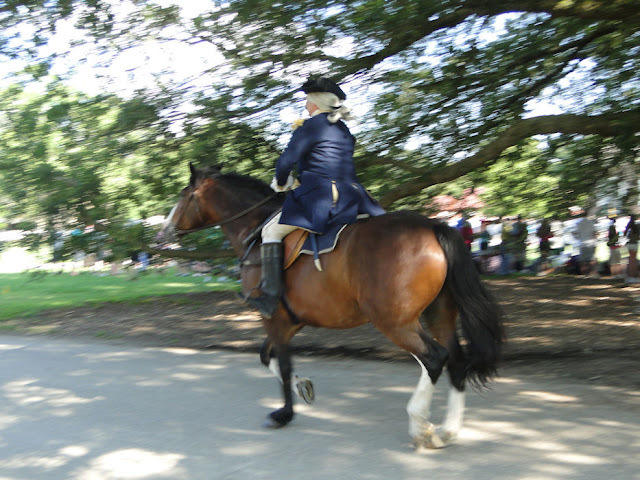 But the George Washington I witnessed was a younger man speaking to us from the month of March 1775, a man who was still hopeful that the more "moderate heads on both sides of the Atlantic would calm the political waters and protect American rights" so that he (and Martha) could concentrate on family life at Mount Vernon, their northern Virginia estate. In fact, during the time he took questions from the 2016 audience, one fellow asked him what he thought about Independence for our country. Of course, if you know anything about our nation's history you'll know that declaring Independence in early 1775 was not what the citizens wanted, nor was it sought after. 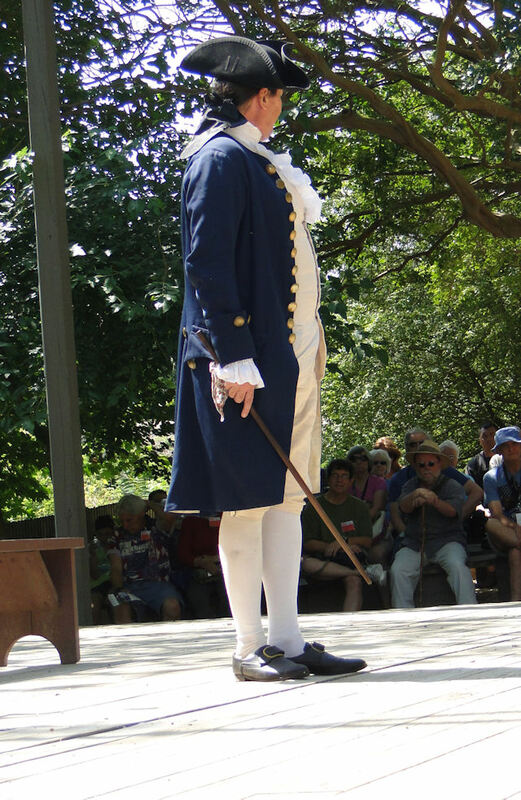 Colonel Washington responded in a controlled manner and stated something along the lines of, "Sir, you could be hung for suggesting such a treasonous act as Independence! No, sir, we do not want to break off from the Crown - we only want a say in matters that concern us." 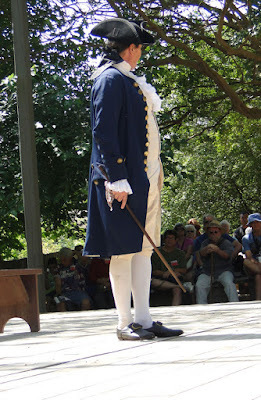 The actor who portrays George Washington, like those who portrayed Jefferson and Henry, did an amazing job in his presentation. Most inquiries from the audience came from adults, but when this young man had a question for the future President, Washington walked off the stage and right up to him to give his answer. 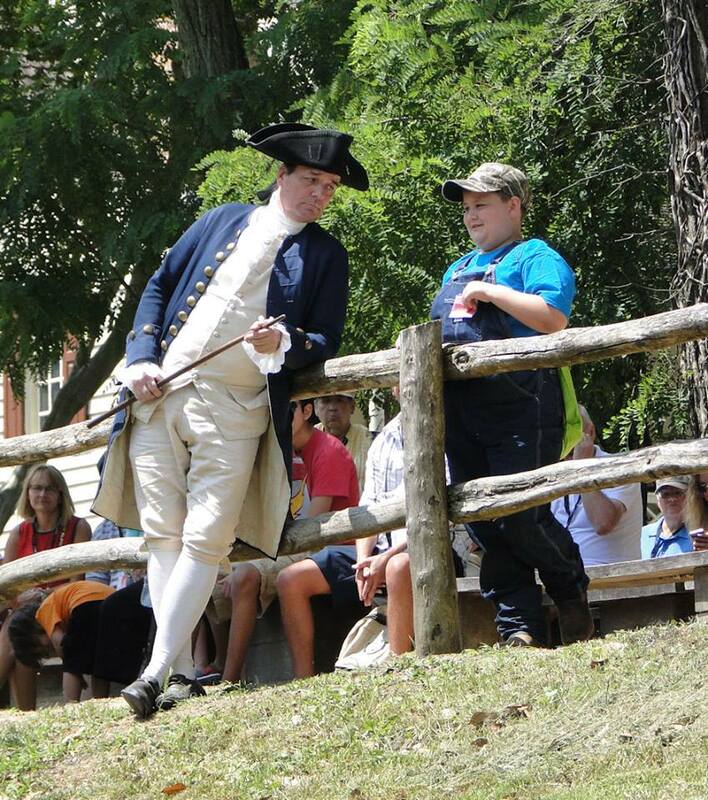 This is something this young man will not soon forget - a face-to-face meeting with Colonel George Washington. And, just like the other "Nation Builders," Washington offered to stand for a "quick sketch" and to answer any other questions individuals might have. I appreciate the fact that each of the Founder representatives does this with the audience members after their speeches. It allows for a more personal connection to history, and that's important. 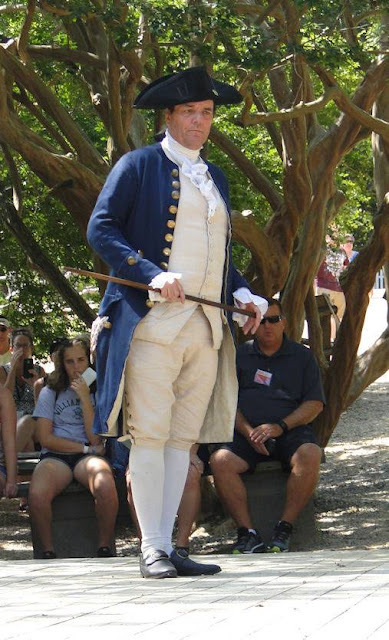 The third and final Founding Father I was able to meet while in Williamsburg: the soon-to-be Father of our Country. On to Yorktown and Victory! 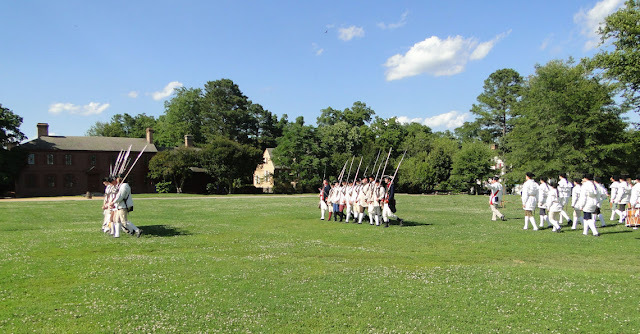 It's late September 1781, and the Allied American-French Army, camped in Williamsburg, is eager to engage the British at Yorktown. General Washington addresses the townsfolk. 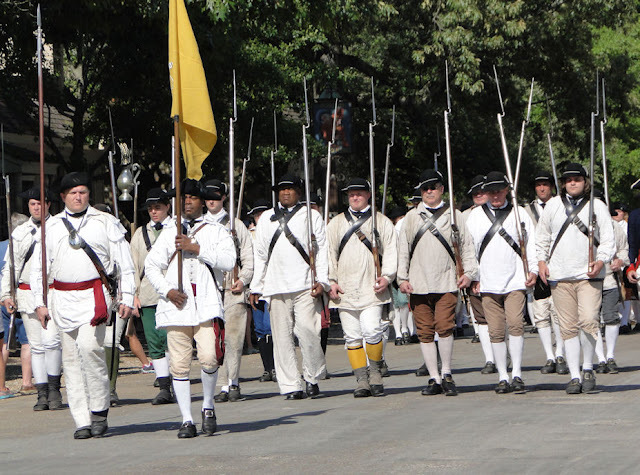 Local militia march in review, with cannon salutes and a fife and drum fanfare. 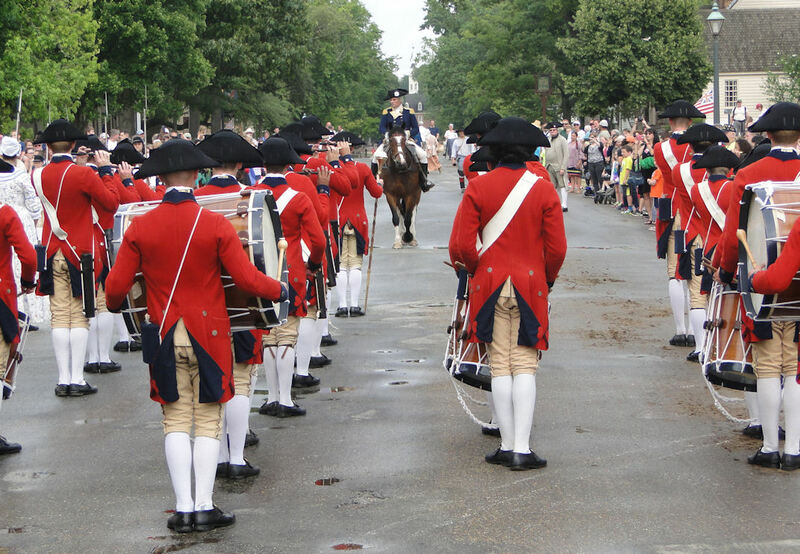 Fife & drum corp played an important part during the Revolutionary War (as well as other wars, as in the Civil and 1812) which was to relay the commander's orders to soldiers in camp or on the battlefield. The average age was eighteen and nineteen, though young boys could enlist as young as eleven or twelve. And here are the local militia. They march along Duke of Gloucestershire Street and then move to the area behind the courthouse, a-waiting to be addressed by General George Washington. 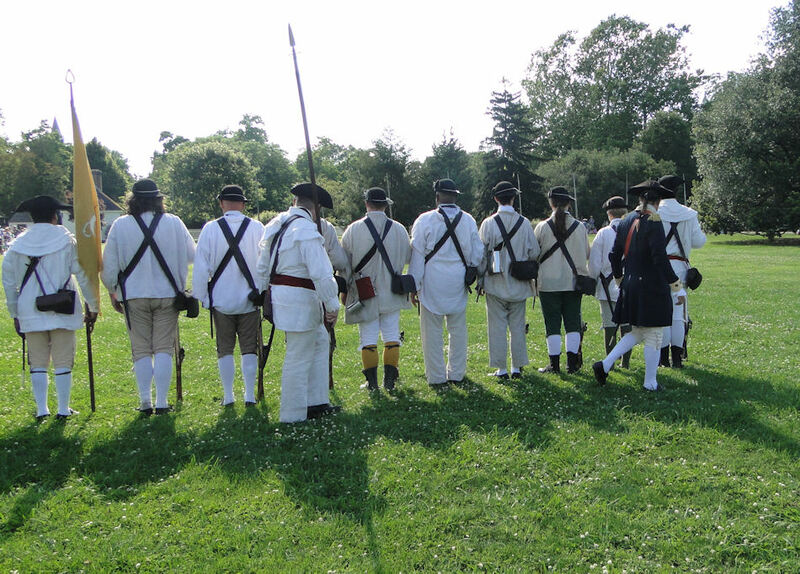 Although I am sure the militia had far more men than what we see taking part in this daily afternoon excursion, it still gives one an idea of what it was like. 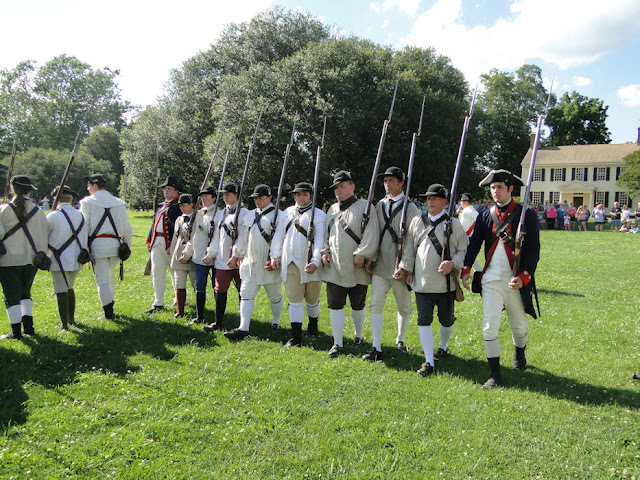 September 28, 1781 - the day to march to Yorktown. "The value of our liberty will thus be enhanced in our estimation by the difficulty of its attainment. Liberty is not yet secure for our posterity! The hour is upon us in which the honor and success of this army as well as the safety of our poor bleeding nation may well depend. Lord Cornwallis and his command are trapped at Yorktown with no means of escape or resupply. 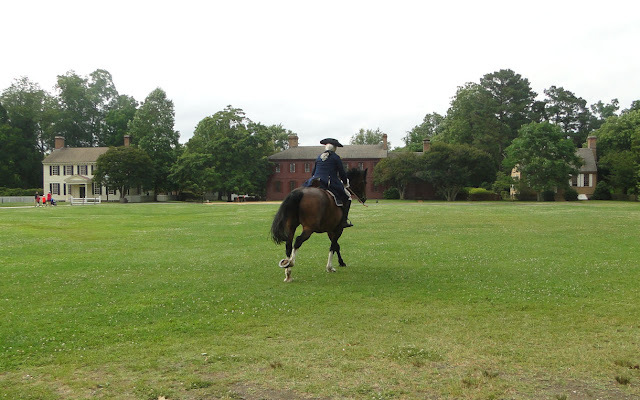 We will march on Yorktown, where I have no doubt but by the blessings of Heaven that we shall repel our cruel invaders and see peace and liberty once more returned to these shores, on a more permanent foundation..."
And this is the way Colonial Williamsburg 'officially' ends the day...watching Washington gallop away. The pictures here are from two different days, hence why Washington is galloping down the road in some pictures while in others, such as this, he is going across the field next to the courthouse. Yes, that is the St. George Tucker House in white and the Peyton Randolph House in red. Heading back home after admiring George Washington. By the way, young Martha Dandridge Custis can be found riding on the streets of Williamsburg as well, along side her brother Bartholomew. She is representing Washington's future wife, though at an earlier stage in her life when she was still married to Daniel Custis. According to the Colonial Williamsburg Facebook page, evidence suggests the she and Bartholomew ("Bat") were very close and, since he rented out the Custis house in that city, the chances were very good that he and his sister did indeed ride about town together during visits. 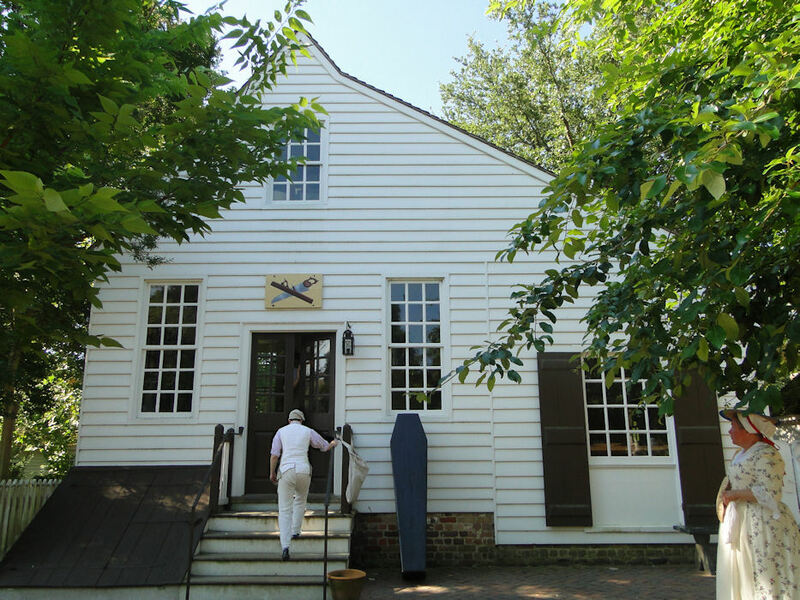 George and Martha Washington were prominent members of the Williamsburg community long before the outbreak of the American Revolution thrust them into the national spotlight. 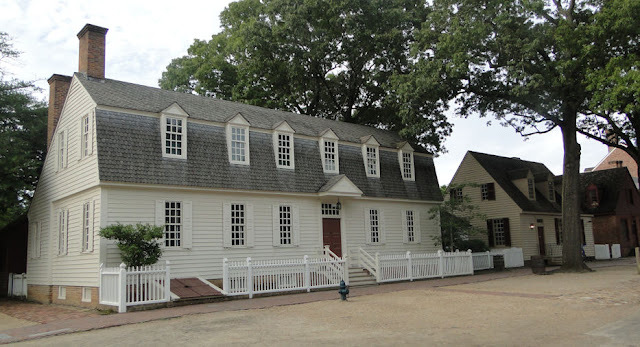 Purposely or inadvertently, our 1st President's life had strong connections here, including getting his license to survey from the College of William and Mary, the interment of two of his wife Martha's four children with her first husband are buried in the Bruton Parish churchyard, and by way of frequent visitation to the city. Again with the horse and carts? 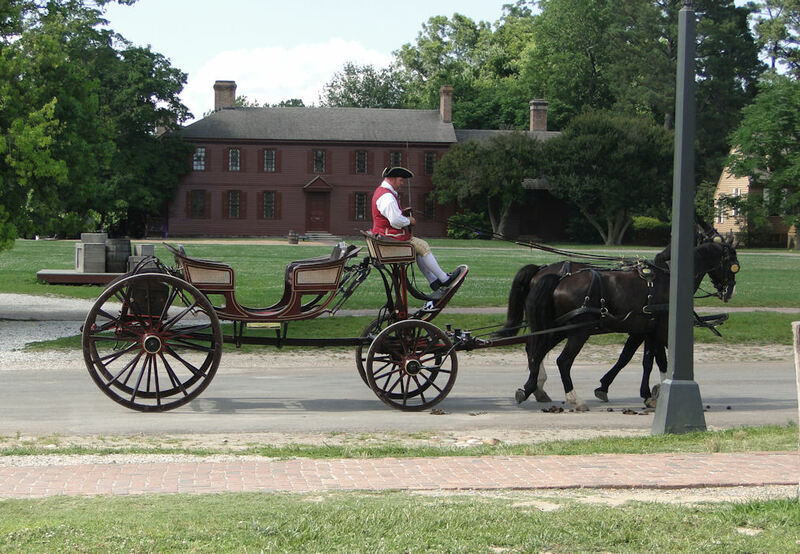 Unless the weather is very hot (like it has been as I write this), horses pulling carts abound throughout the historic city, giving rides on carriages, or being saddle-ridden, which gives Williamsburg the authenticity of the good old colony days. 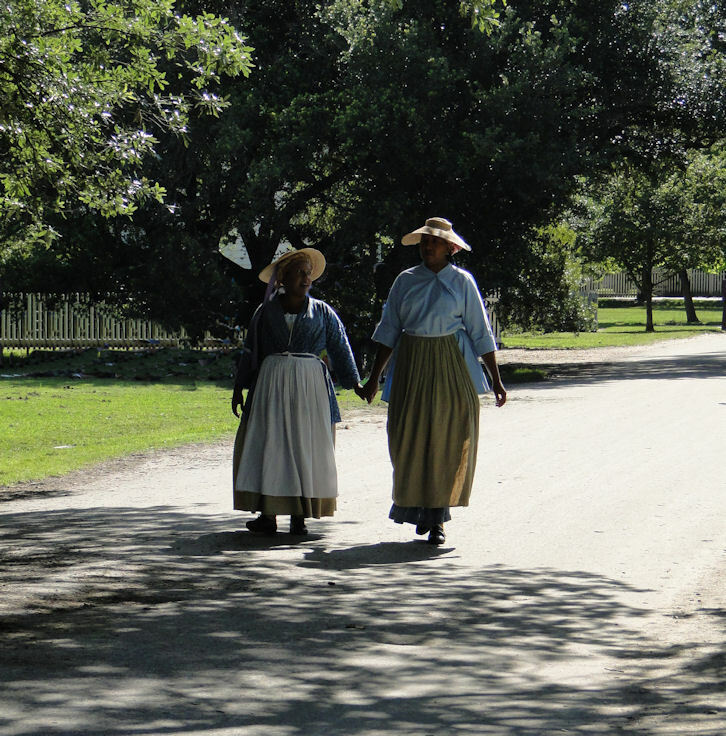 I read where there are a few workers who stay in some of the historic houses there in town. Can you imagine waking up and looking out your window to see such beautiful historic homes? 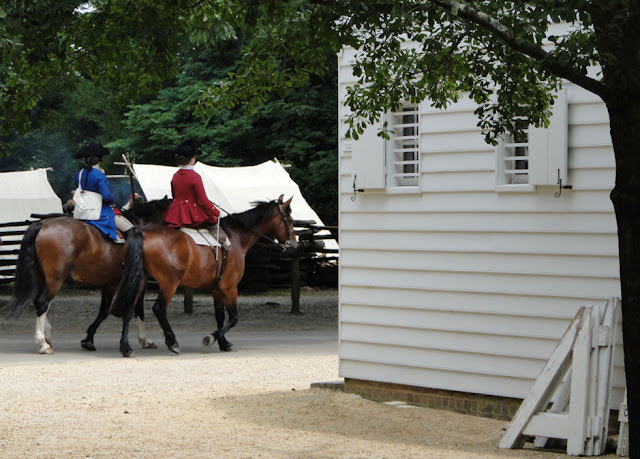 Colonial Williamsburg is a living, breathing metropolis of the American Revolutionary War period. This was my experience. And it was an amazing one, for I took this experience to even greater heights by immersing myself right into the scene along side of the other colonials. And they treated me as one of their own. Colonial Williamsburg is also a historic city whose role in the fight for our nation's independence is sorely under-represented. 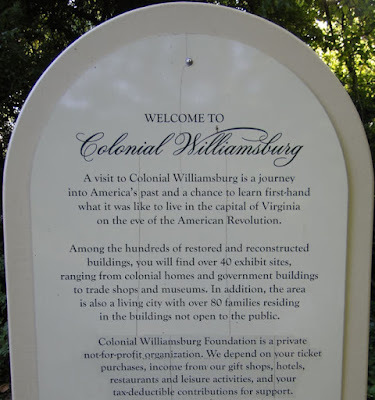 I've searched deeply into my history books, and I have quite a few, and barely more than a word or two - seriously - is even mentioned on Williamsburg's participation. Why is this? How could this city of Thomas Jefferson, Patrick Henry, George Wythe, and George Washington, among others, be so ignored? This needs to change...and any part I can do to help I will, for otherwise only part of our Nation's story is being told. Love this house! But I know nothing about it and cannot find any information - - can you help? 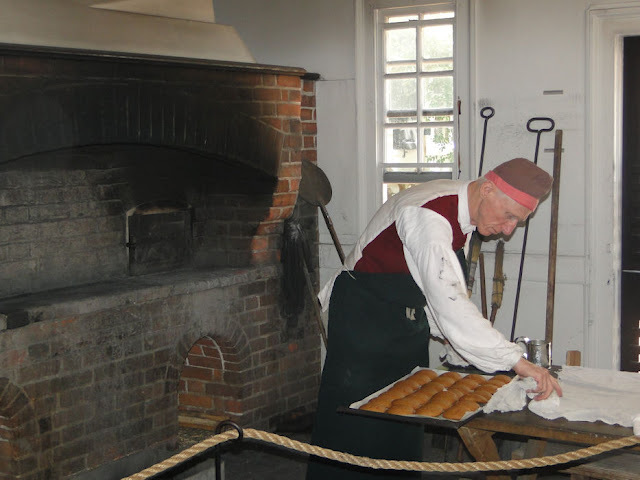 I hope you enjoyed part 3 of our Colonial Williamsburg vacation blog journal. I have at least two more coming...possibly three more...and I do hope you are enjoying these posts as much as I am reliving my time there. All are filled with lots of photographs and historical information...and fun.